Click on buttons to the right to navigate for keys from different parts of the world. Click on the picture to enlarge it. 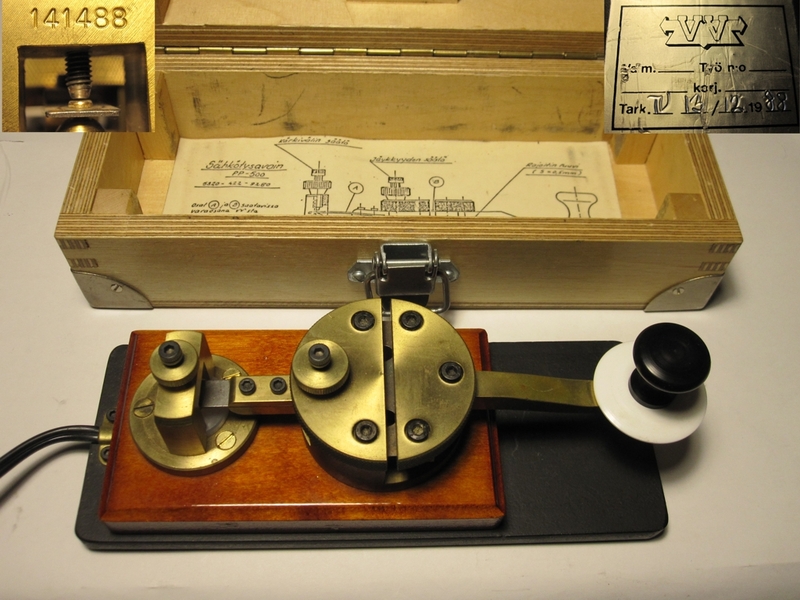 Telegraph (Morse) key collection of OH6NT. Manual keys are now sorted by region ! Key numbers roughly indicate the aquisition order. Enjoy! Vy 73 de Thomas, OH6NT. You can offer any spare key to me. It will get a good home. Donors will be credited! I have duplicates of some keys and will trade/swap them (no sales). Tradeable keys have a red note. Contact details: See QRZ.com. Use of any pictures is prohibited without written conscent from me, the copyright holder. Mail meif you want to use pictures. Better resolution photos are available on request. Visitors: I can be reached at <my_callsign>@sral.fi - Updated: 1-Apr-2019. 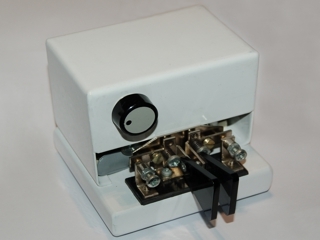 such as mechanical and electronic keyers, optical devices, Morse registers and toy keys. K1. My fathers OH6NZ (SK) key, my first one. Heavy marble base, the key is probably made by himself about 1950. Easy to adjust and operate. K7. Jokey #003-08. Hand made by OH6FJF Jalo Ojanperä. Brass metal work on oak base. Superb feel and craftmanship. K8. Jokey #041-10 is intended to be a replica of the Finnish State Railroads (VR) standard key (see K9 below). Finnish handicraft by OH6FJF Jalo Ojanperä. The base is temporary. K9. A Finnish State Railroads (VR) key, serial # 75417. Made in Russia by Siemens & Halske in St. Petersburg before 1914 (or maybe as a copy at the VR Elecrical workshop). Donation from my very good friend Thomas OH6LEI. Thanks OM! K28. A Finnish brass key on birch wood with heavy iron base. Made by Turku Vocational Institute in the 80's, resembles a "Swedish Pump" key. K31. Magnificent Finnish key made by OH4LRP Olli from hyrdaulic valve and bicycle parts. Very smooth and exact action, heavy birch base, weight 1,5 kgs. K37. 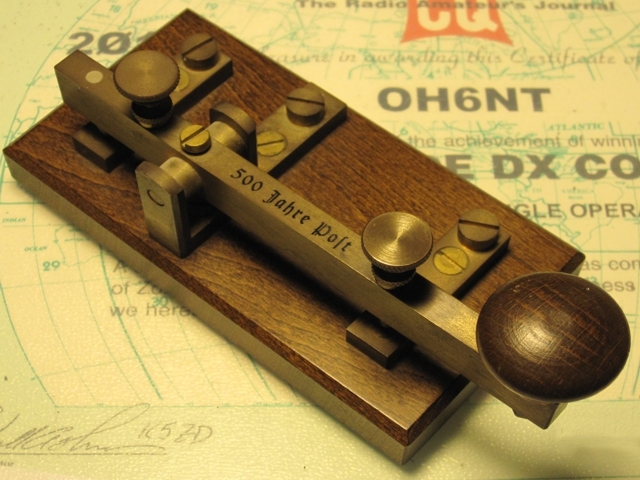 Finnish key from Tampere Radio Club. Marked "TRA", "OH3NE" and "2". Bought from auction site. Make unknown, model "Siemens & Halske". Any info would be appreciated! K43. This is a Finnish KBX-102B key made by OH1KB Tapio Hirvikoski's moulding company "TH-yhtymä Oy" in Pori, which closed down 2012. The model is derived from a Russian key. 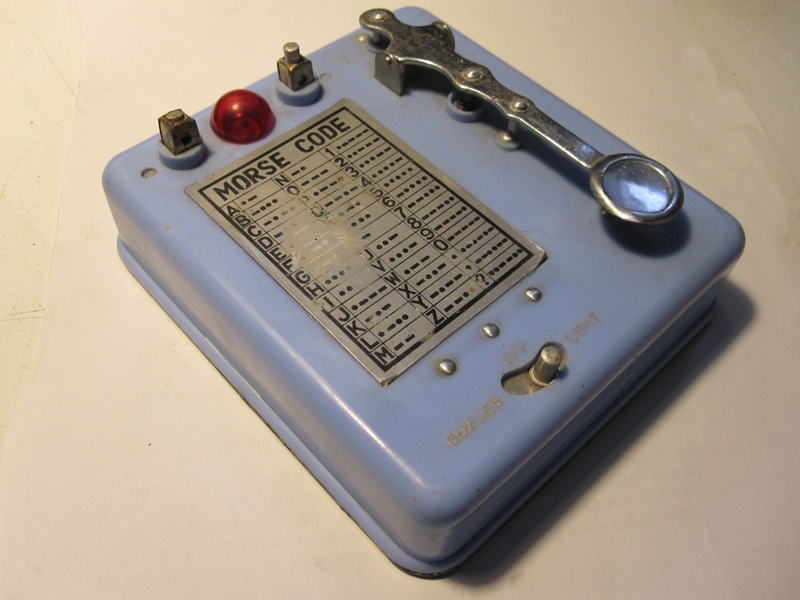 TH-company also made manipulators and electronic bugs (KBX-101). See E3 K44. 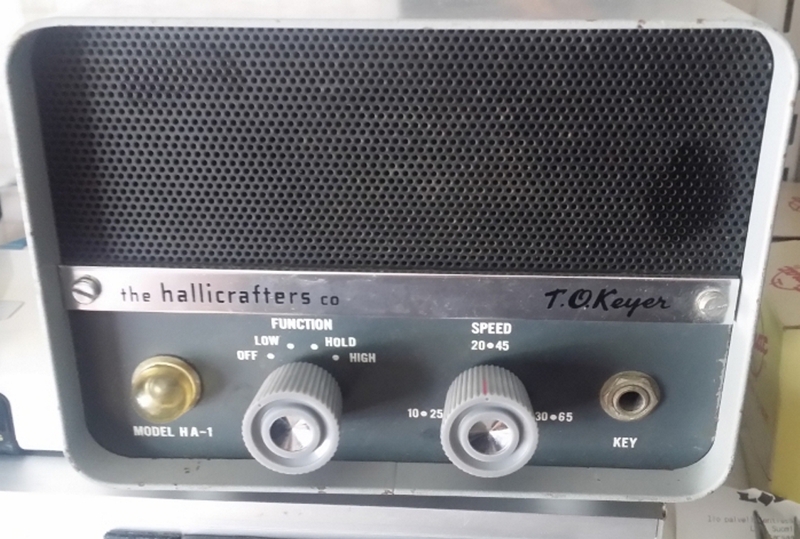 This is a VERY rare KBX-103 key made in Pori by "TH-Yhtymä Oy" (see resemblance with K43). Only about 20 of these were made. I managed to get this brand new one direct from the maker when I provided him with some help.Tnx OM Tapio, OH1KB. K61. Authentic, very rare key from the Finnish WW2 guerilla radio "Kyynel". It is really tiny, only 35 (w) x 85 (l) x 26 (h) mm! Mint condition, original cloth cord and plug. Sheet metal cover with adjustment hole/lid for the spring tension. An older model is the K62 to the right. I came by this key thru a ham friend, OM Kari OH5YW. K62. 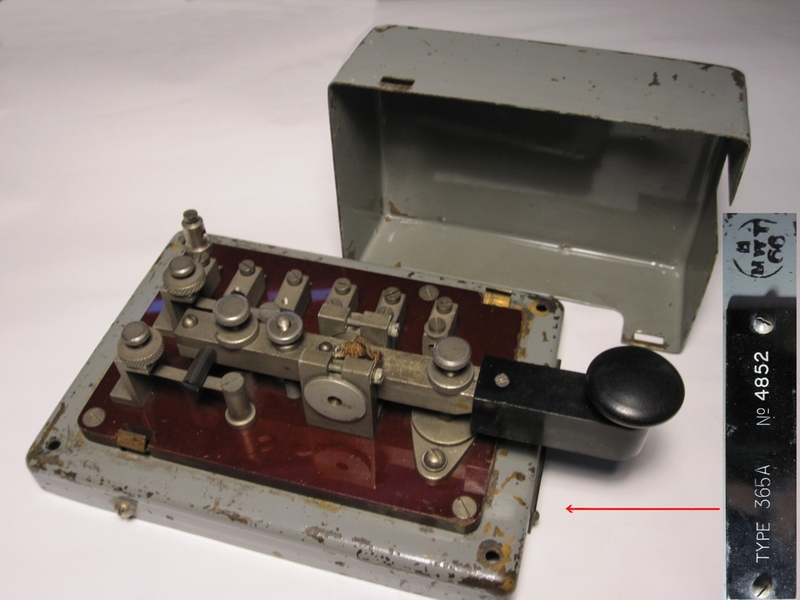 Another (earlier) model of the Finnish key for the WW2 guerilla radio "Kyynel". Very rare in this condition, original cloth cord and plug, compare with K61. Note how the plugs are attached by sewing! Sheet metal cover. Size about the same as K61, just a little higher. Bought from a net estate sale. K68. 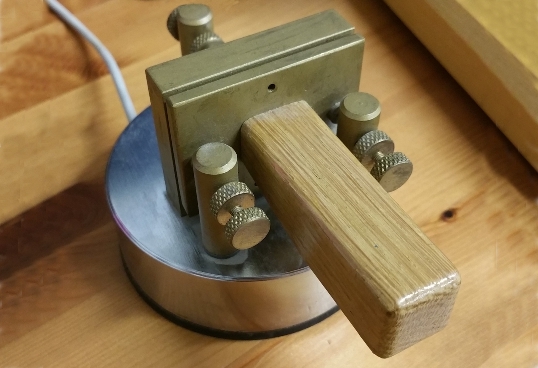 Home made key of my good friend OH6MH (SK). Donors OH6ELN & OH6HXU. Thanks OM:s! K74. This is OT OH2SN's key from the 1920:s. Gift from OT Reiska, OH2HK as a token of our cooperation. Thanks OM! Make probably Valtion Sähköpaja (State electrical works), see resemblance with K75. K75. Finnish Armed Forces key, marked "Puolustuslaitos". Marking was in use 1922...1974. My guess is around 1950's. Nickel plated brass, base is hard rubber, 5 x 8 cm. Intended for mounting somewhere. K84. This key is a gift from a friend of mine, Mr. Alf Knuts. Thank you! It is from a Finnish artillery radio set type VRGK, used during WW2. 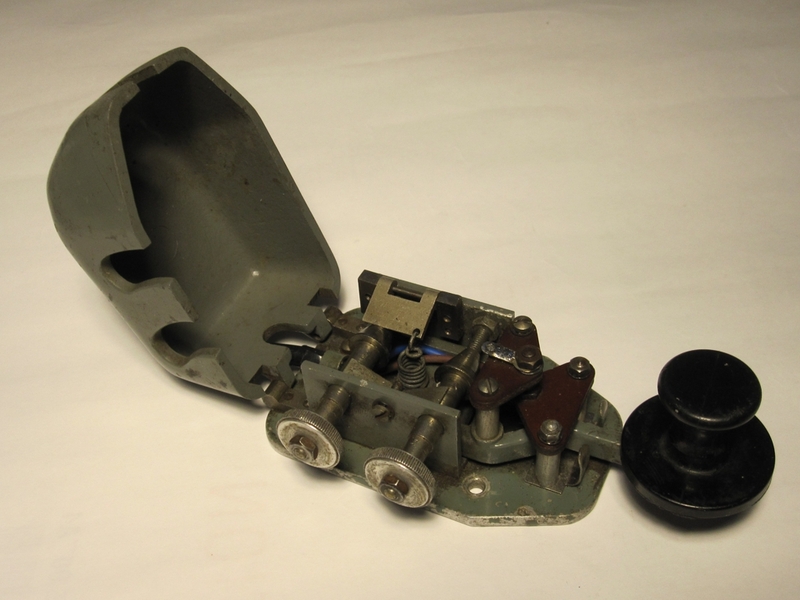 The key was mounted in the chassis, key arm protruding out of a hole in the front of the radio. Made by ASA radio in Turku about 1942. The knob is NOT original! K85. Jokey no. #048-16. 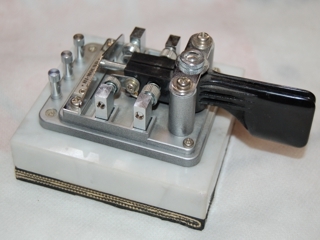 A miniature manual key, hand made by OT Jalo Ojanperä OH6FJF in 2016. Only 5 pieces made. All brass, weight 350 grams, brass footprint is 28 x 62 mm. Base is oak. Bought from the maker. K86. Another of OT Jalo Ojanperä's hand made keys. This is an unnumbered prototype from Sept 1, 2012, made "for fun" according to the maker, from who I got it in a trade operation in May 2018. K98. 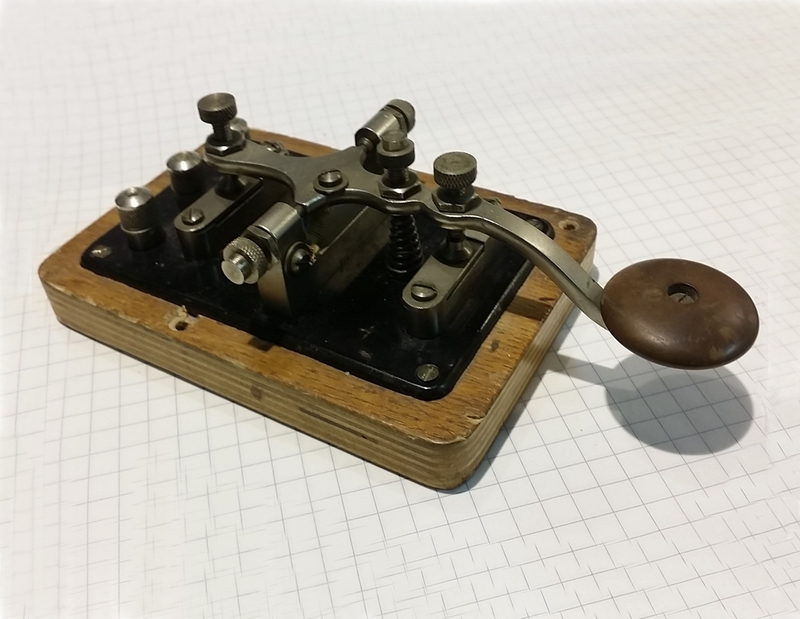 A factory made key, bought from the Navy radio club OH1AJ in Turku. Some similarities to the "Lautkari" K99 key, but simpler. Nickel plated brass with 6-ball bearings, very precise and easy to use. Contacts are brass/brass. I've mounted it on a teak base with a new knob. Made in the 1940's by unkonwn factory. Previous owner OT Jaakko Männikkö, OH1JM. OM Antero OH1KW made it available. K99. This key mechanism, commonly called the "Lautkari" key was made by the Finnish Army during/after WW2. It's designed by Major Ragnvald Lautkari, a technical expert at the Intelligence troops. Used for example by the Marines. This one was donated in 2017 to my collection by OM Kari, ex OH2BHM, who bought it 1966. Thank you! K100. This is one of my best keys! Type PP-500, made in 1988 by Finnish Army Signal Depot ("Viestivarikko"), decomissioned 2009 (now Millog Ltd). Delivered in heavy birch veneer box. All brass on heavy steel base plate, weight 1,89 kgs. Serial # 141488, delivery check 13.12.1988 by "TU". Condition as new, very exact function. The arm is pivoting by a steel blade, as on a "Swedish key". K106. A very tiny key, possible for a manpack or spy radio! Unkown maker, might be a Finnish prototype. Frame is made of brown Bakelite, cover is thin sheet metal, black wrinkle paint. From dissolving of an military technicians collection, who worked at the Finnish Signal Troops electrical shop.Any additional info is welcome! K109. An unknown key. No markings except an embossed "1" on bottom of the thick sheet metal base. Cover is sheet aluminium, key base inside is black bakelite. Arm and pivot structure are iron, wooden knob, one silvered n/c contact. Any info is welcome! K110. Finnish Military Forces bakelite key (Puolustusvoimat) made by ASA Radio factory in Turku 1941-1945. 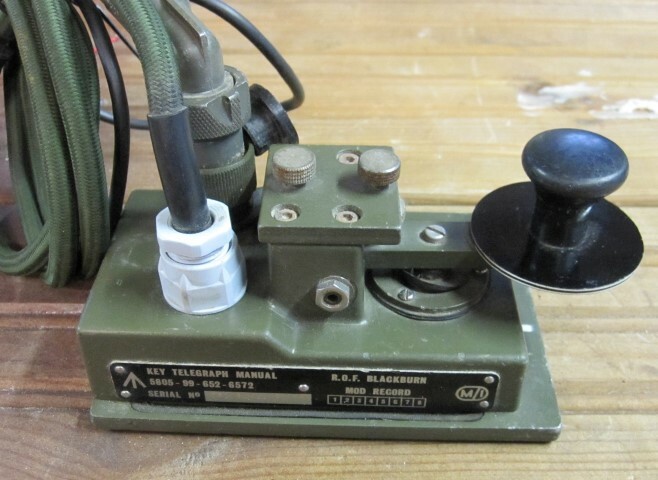 Used with the Finnish army field transceiver VRFK. Black bakelite, brass inner parts. Not procured yet. (Tc 91160). K20. Swedish key, made by SRA (Svenska Radioaktiebolaget) for the Swedish military in the 1940's. No markings, heavy marble base, manual TX/RX switch at left. Rare because of the single circuit. Usually these keys have double circuits, see K70. K21. Swedish SRA style brass key, white painted, made 1971-1973 by precision toolmaker Arne Svensson at Lund University of Technology in Sweden. Only 7-8 copies were made. Original cost at the time 50 SEK. Mounted on a heavy prespane plate. Bought from Eskilstuna flea market 2013. Tnx SM7EQL Bengt for the info. K40. 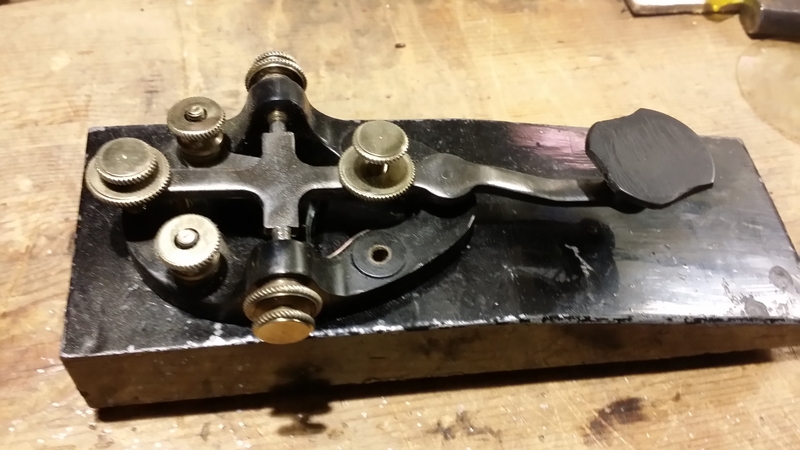 Original "Swedish key", military training version, made by Lennart Pettersson & Co., Hoverberg. Plastic dust cover is missing. Condition otherwise as new. K41. 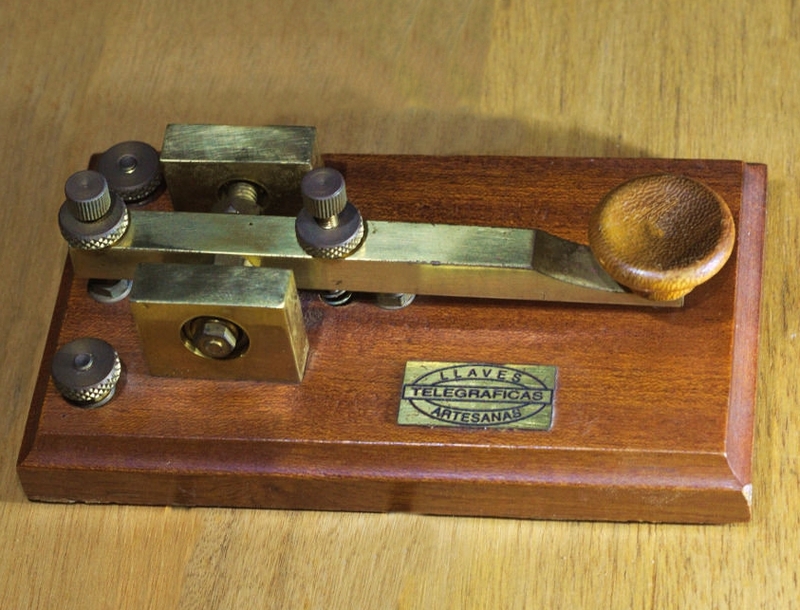 Original "Swedish Key", Ham version by Lennart Pettersson & Co., Hoverberg. Condition as new, personalized to the prevoius owner SM7OH. These were first called REX keys due to the maker, a mechanical shop "Radio REX" in Östersund/Sweden. K42. An older Swedish Key by Lennart Pettersson at Hoverberg. This one is also the military training version. Knob is not original, and the sheet metal dust cover is missing. Otherwise in good working order. K46. 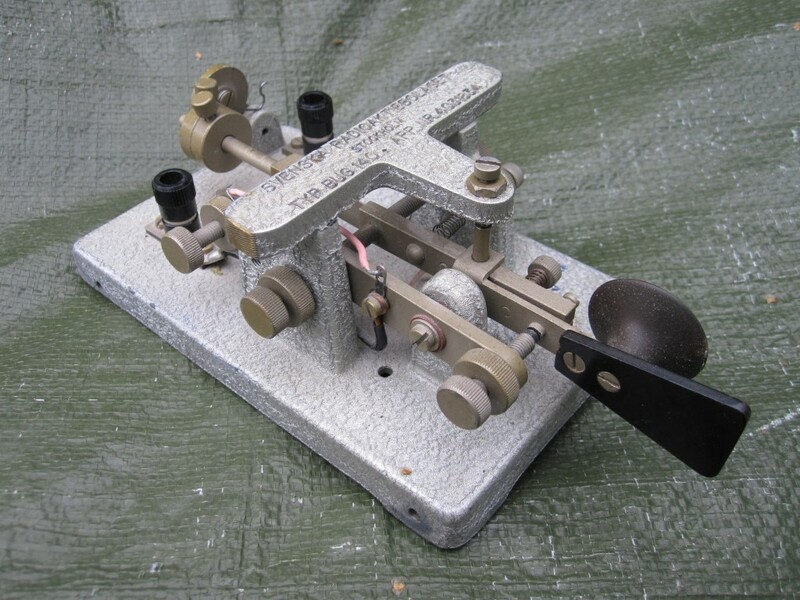 Swedish miltary key, Tc15534, used commonly for the Ra200 radio set. "Tc" is short for "Tygcentralen" (military vocabulary for Equipment Center). The "Tc" number is a storage number. Complete with RX/TX switch and an original "toothbrush" connector for the radio. As new. 1950's. K47. Swedish brass key, previous owners are OH2ZH Voitto, from 1961 his son Timo OH2BBC. Originally this is a Televerket Radio commercial ship key. It is also on display in the collection of Swedish Radio Museum in Gothenburg (Ref: rm 00570). Base is curly birch, and secondary base (not original) is iron. K51. 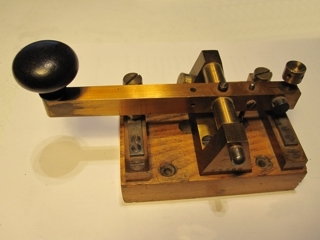 Swedish key from about 192x made by Svenska Aktiebolaget Trådlös Telegrafi (SATT). Marked "System Telefunken" which indicates early 1920's! The type was used 1941-48 in Sweden for ground to aircraft radio communication with FR-2 sets in plane types Saab B18 and SK14 (North American NA-16-4M). K69. My first Original Swedish Öller & Co key, made about 1865. This is a chrome version and in vg condition. 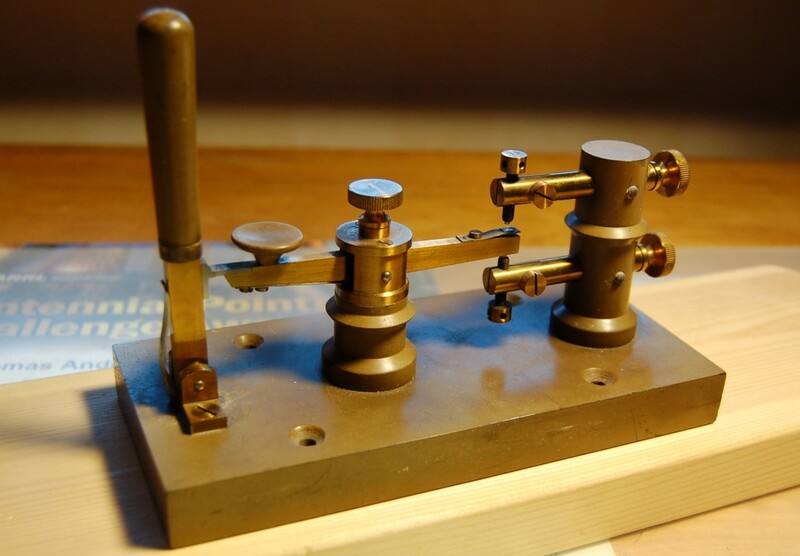 This key was made available by Kari, OH5YW. See also K122 below for more info! Click on the pictures for bigger display. K70. 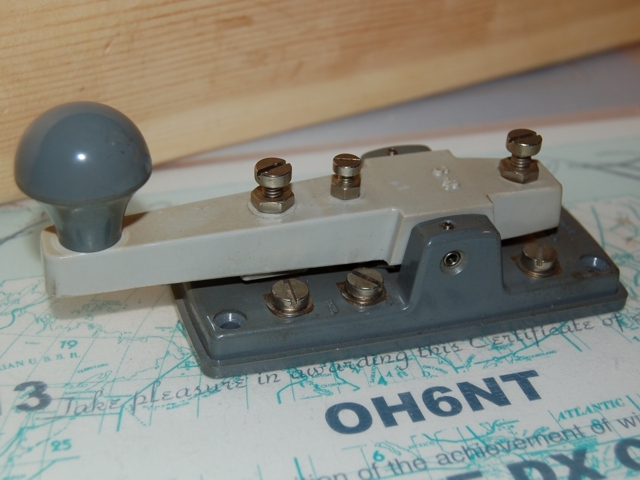 Swedish Navy or Coastal Radio key, type TGN641 made by SRA about 1950. Heavy with molded base. Dual contacts, separate ciruits. Single contact versions are known, see K20 (an earlier issue). Very good quality, smooth operation. No markings. Ref: rm 00390 at Radiomuseum in Gothenburg. K71. 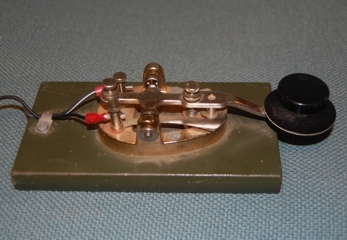 Svenska Radioaktiebolaget (SRA) key from OT SM2JKI (SK) dissolving. Swedish military key, issue Tc15223. "Tc" stands for "Tygcentralen", the Swedish Mil. vocabulary for Equipment Center). The number is it's storage number. TX/RX switch on top and a four prong rubber molded "toothbrush" connector. Used with various militay transmitters, ie. Ra620 and others. K122. My second Öller key, made available by a friend in Norway.This in not nickel plated, and the spring tensioner screw is not original. Otherwise original vg. cond. K72. 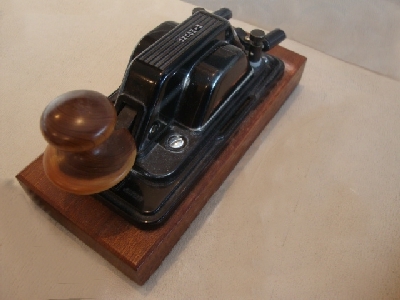 An original L.M.Ericsson TA610 key on wooden base, with LM Ercisson logo. Single circuit, opposed to the K70 above. Good quality, smooth operation, some vear and tear. Used by the Swedish armed forces and commercial services. K87. 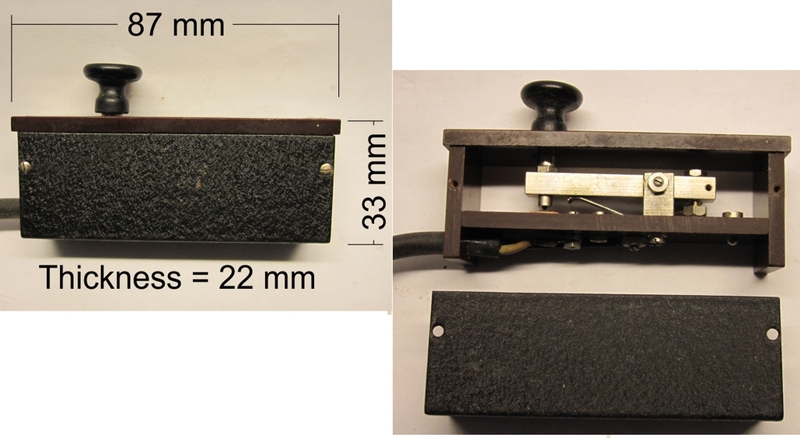 A swedish SSA-key, sold by the Swedish Amateur radio Association (SSA) in the 1970:s. Thousands of these keys lure in swedish hamshacks around the country. Very good feeling. Similar mechanics to the Swedish Pump key by Lennart Pettersson (see K40, K41) and the Military key K71. I have two of these, trade possible. K88. All brass manual key with ball bearings and a very long arm, 22,5 cm (about 11")! Probably hand made. Base plate is made of prespane. Knob is not original. Maker is unknown, but the key is of swedish origin. From the Radio Museum in Gothenburg. Any info would be appreciated! K90. A swedish training key called Jungfrunyckel ("Virgin key"), used by Svenska Lottakåren (the Swedish Women's Voluntary Defence Corps) during WW2. 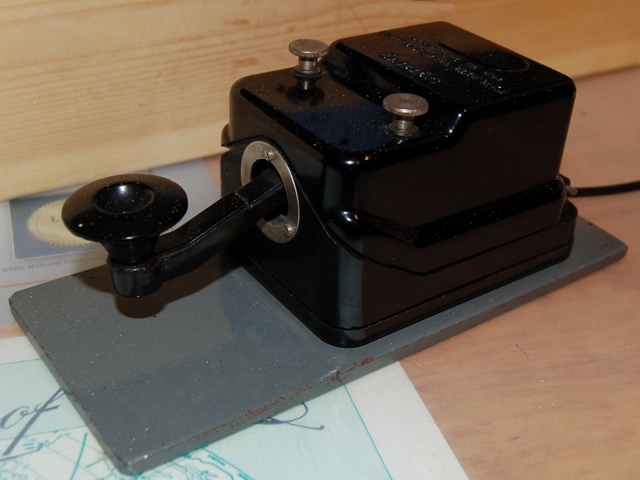 The key was mounted on a base together with a battery box containing a buzzer (plate shown is from such a box). Made 1941 by Stockholms Tygstation, Signal Works (SiS) in Sundbyberg. K101. 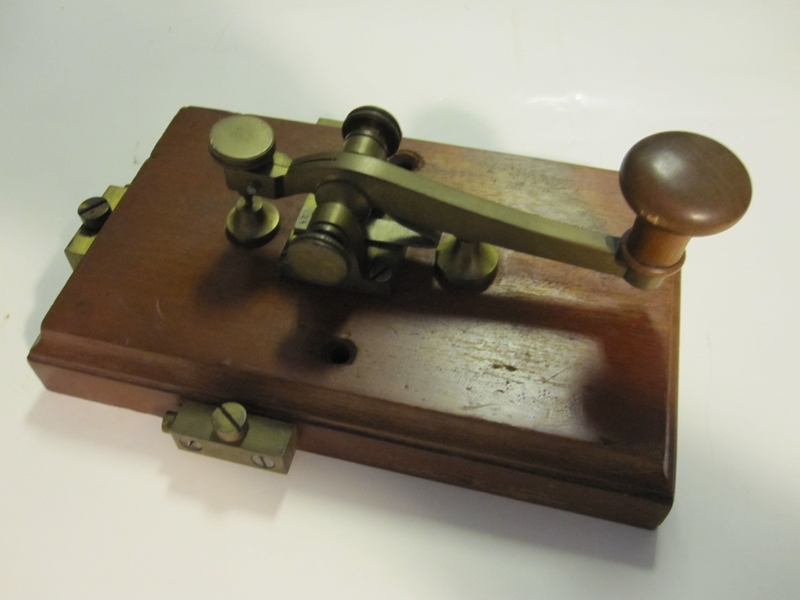 An early unmarked military telegraph key from Sweden, used with the field sets 1W Br /m28, 30W Kr m/29 and others. Marked "1944" on the bottom with a lead pencil, but is older (about 1928 according to radio model numbers). A few are known to exist. Another variant with turned pillars instead of bent iron pivot and contact supports exists. Bakelite with Pertinax base, and brass lid. K79. Norsk Marconikompani A/S, Oslo, Norway. 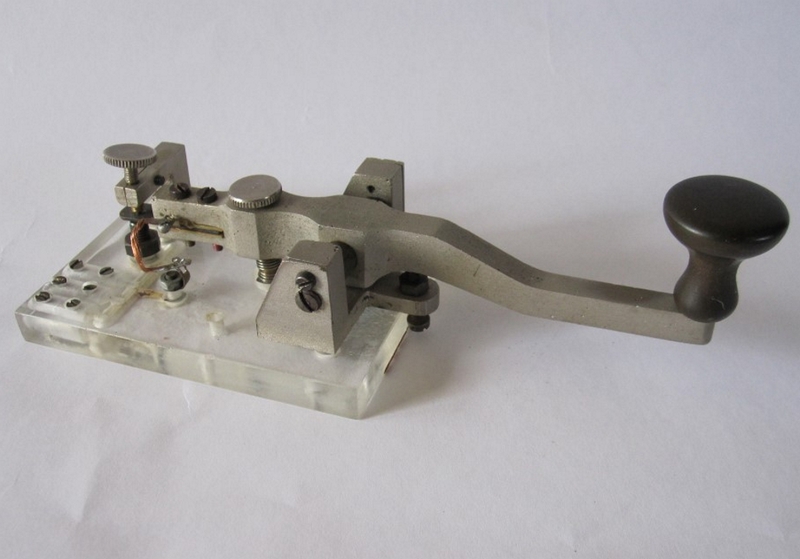 A commercial radio telegraphy key, type 803, serial no. 8043. From a flea market page. The history of this key is unknown, it is from an estate sale. These keys were used in training of navy and shipping radio operators in 196x...197x. K80. 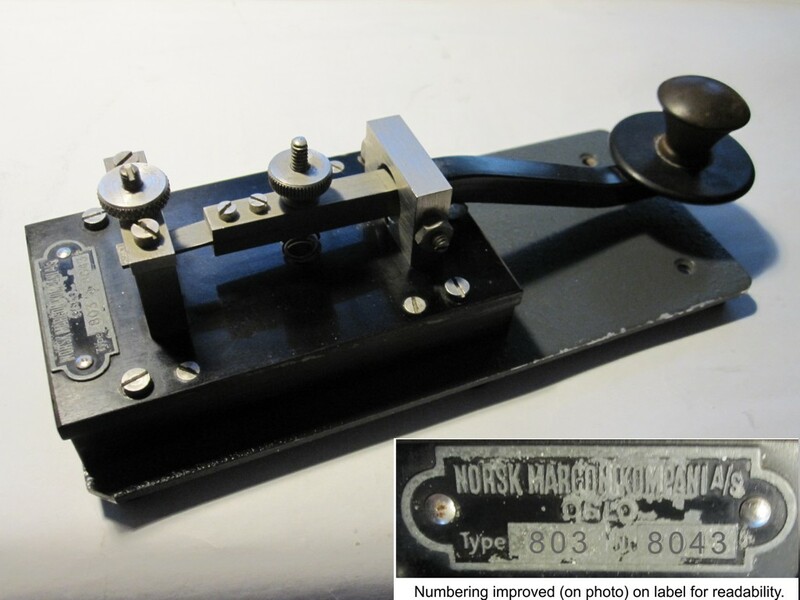 This is another Norwegian commercial key, made by NERA A/S. Used onboard m/s Bore Star/Silja Star (OIGM), later Orient Express (9KVJ), still later m/s Wasa Queen (OJDZ). Rugged and exact feeling, excellent condition, with dust cover. Salvaged by SK OH6PJ Juhani when the ship's station was decomissioned. Sold by OM Kari, ex. OH2BHM. Tnx for info OM Hans, LA9LT. K117. A/S Elektrisk Bureau, Oslo, Norway has made this fine maritime key for commercial shipping. Operators calls it the EB-key. It is very stable, weight 860 grams. Chrome plated brass hardware. This is a very appreciated gift from Frank Berglund, LA9IQ. Thanks OM! K123. 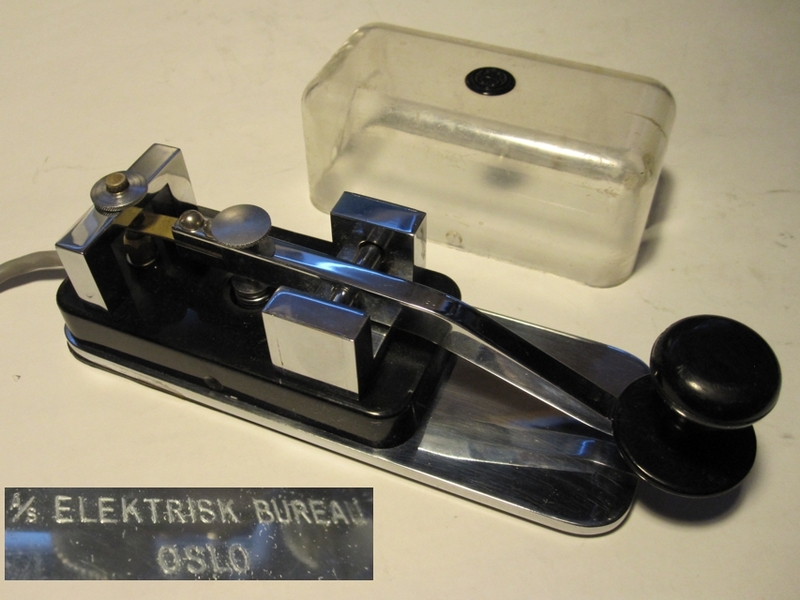 Another Norwegian EB maritime key (A/S Elektrisk Bureau) for commercial shipping. See K117 for more details. In excellent condition, the cover is without cracks, and that's rare! The knob is not original, but a close resemblance, and the red logo button is missing from the lid. Can be traded, since I have two! Not procured yet. Not procured yet. K81. 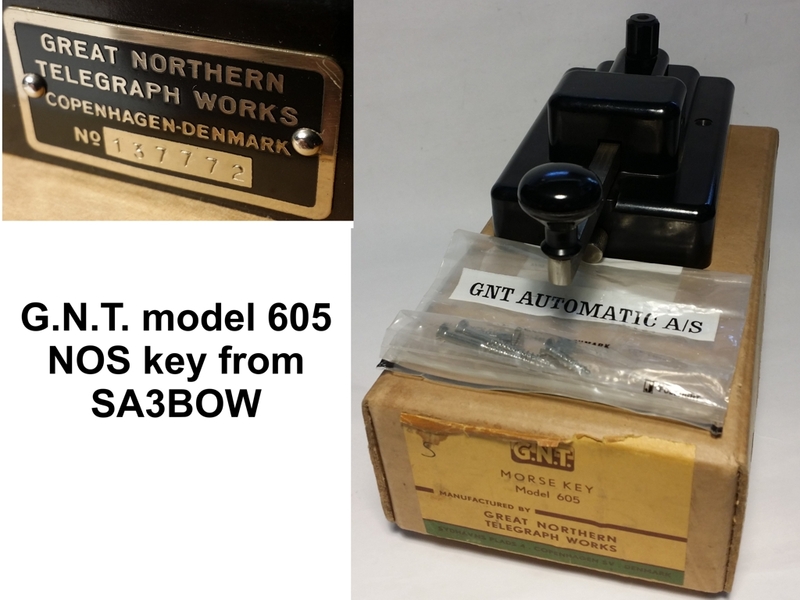 A unused G.N.T (Great Northern Telegraph Works) model 605 key, serial no. 137772. These keys were made from around 1948 up to 1969. Donated by OM Dejan, SA3BOW. Thanks a lot! Came to me complete in the original box with connection plate and screws for attachment to a tabletop. Even original connection wiring is in place! Made at Sydhavn plads 4, Copenhagen Denmark. K82. 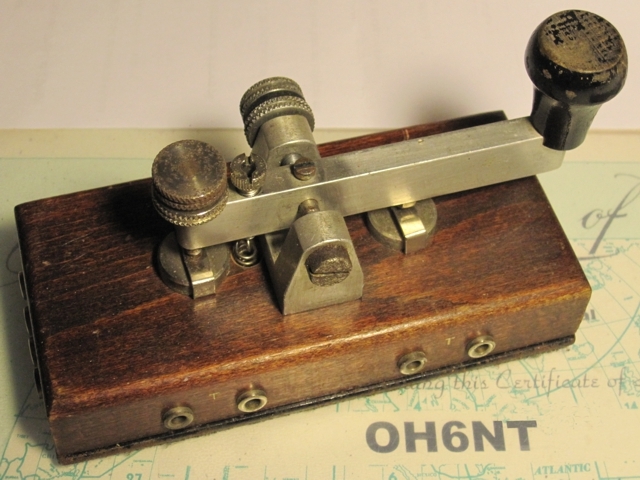 A British built copy of the G.N.T Danish key (see K81). This one is made under licence by Sedgewall Communications Group in the 1960's. Parts were maybe bought from GNT, and the keys was assembled in the UK. Both British and Danish keys have the same mould numbers, but two missing steel pins differs from the original. Info by OM Peter, G4TFH. K89. 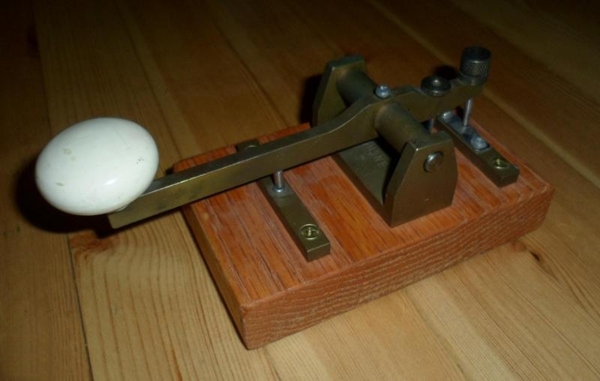 Here we have an early (look at the knob) very rare Danish Amplidan "single adjuster" key. 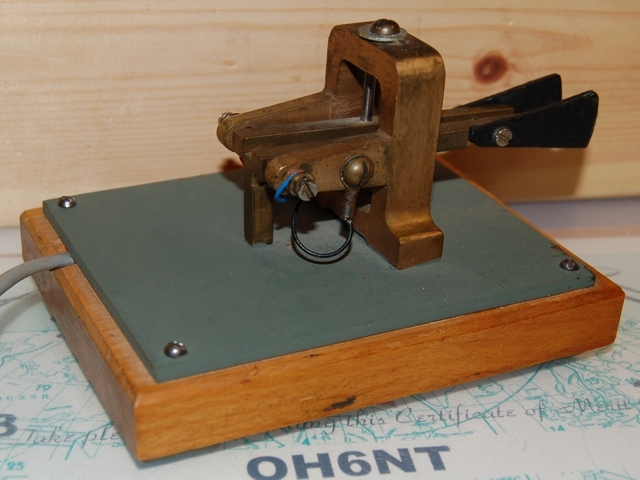 It is even rarer because of the almost square base and the inductor, both original to this Naval commercial key. I got it in my collection by a very generous swap operation with OM Patrick Wathieu, ON6XS in Belgium. Thanks! K129. 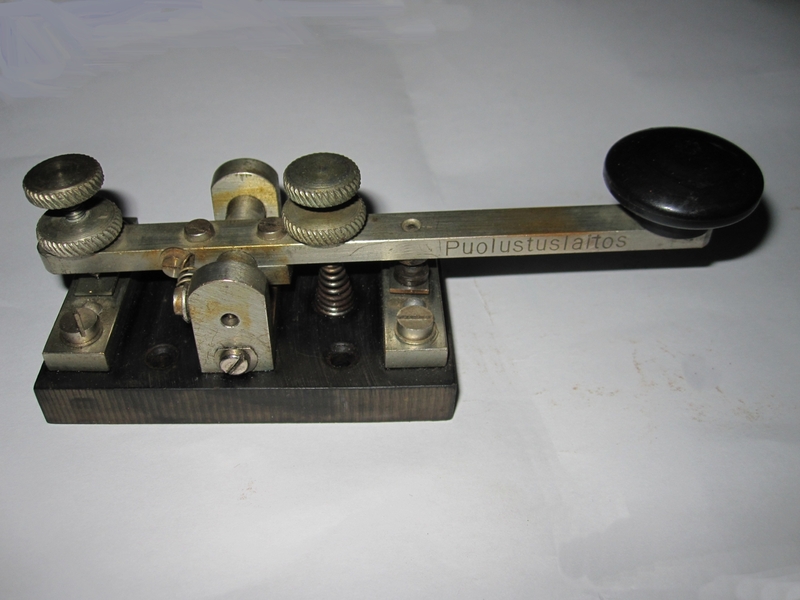 A MP Pedersen (Amplidan) "dual adjuster" commercial/maritime key from Denmark, bought from a radio club. Nice condition, some pitting on the nickel coated adjusters, and an invisible crack in the bakelite cover. Not procured yet. Not procured yet. K3. 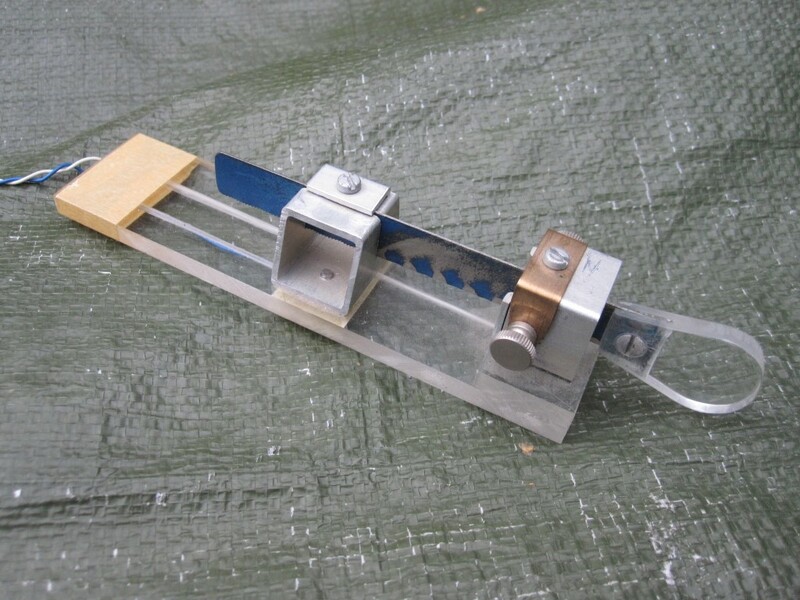 R.A. Kent Engineering (UK) long arm straight key, built from kit. Acquired together with a Kent battery operated training tone generator from a ham flea market. I have two, trade is possible! K6. 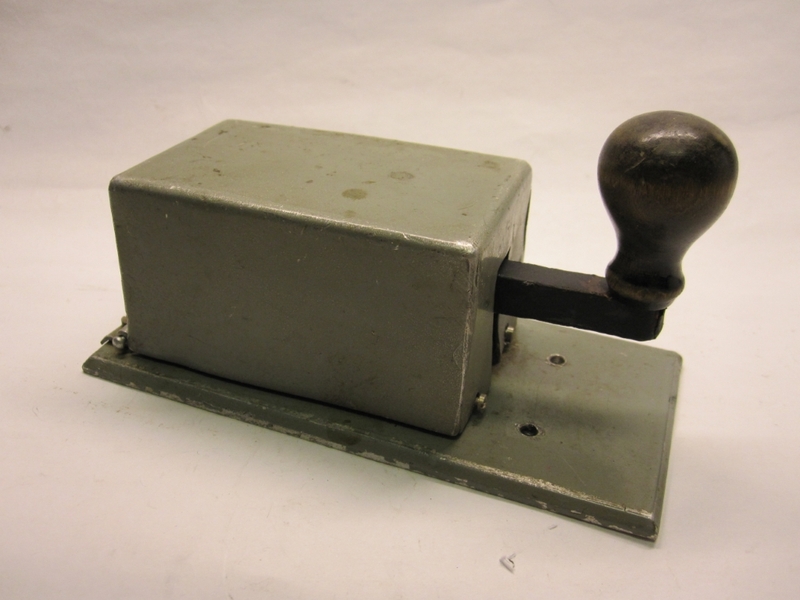 General Post Office issue made by Signalling Equipment Ltd., Potters Bar, Middlesex, England. Model "F-17", marked "L38" on the frame and the arm. Frame and arm are diecast brass, wrinkle painted. A nice little key. K13. 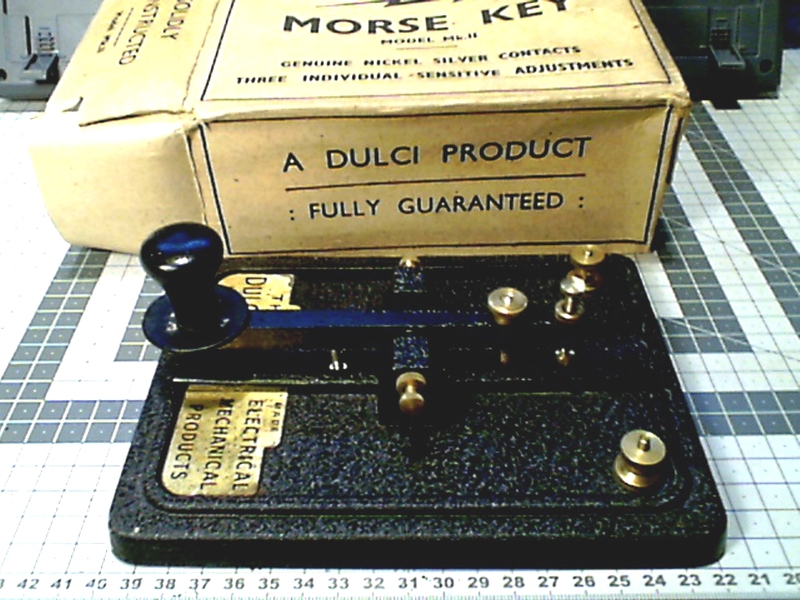 A British bakelite BCE type key (502/C307/McMurdo) used with the British Racal set. Different makers in several Common-wealth countries, distinguished by letters around an arrow: GB =↑(no letters), Australia = D↑D, Canada = C with↑inside, New Zealand=N↑Z. Tnx info Jan, PA3EGH. K23. British WW2 key, type KEY WT.8 AMP No.2 MK II. Mounted on a black bakelite plate "NORSTEDTS", probably by some ham operator. Bought from swedish auction site. This has the large finger shield used by the Marine. K24. British WW2 key. 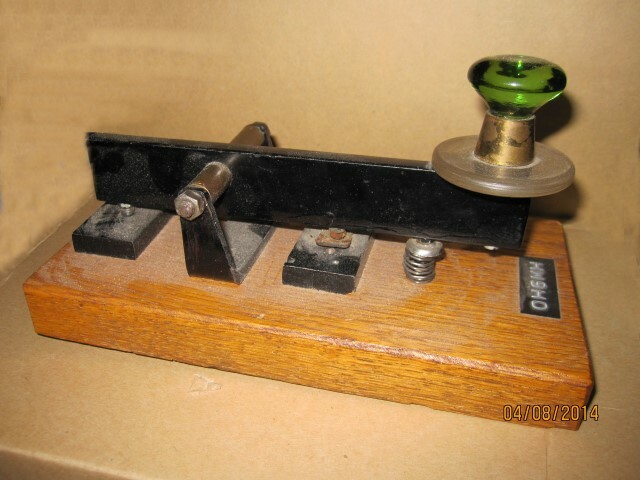 It is a brass and black plastic key, marked KEY WT.8 AMP. No.2. MK III. There are hundreds of variations on this key. I have two of these, (see K124) one available for trade. K124. 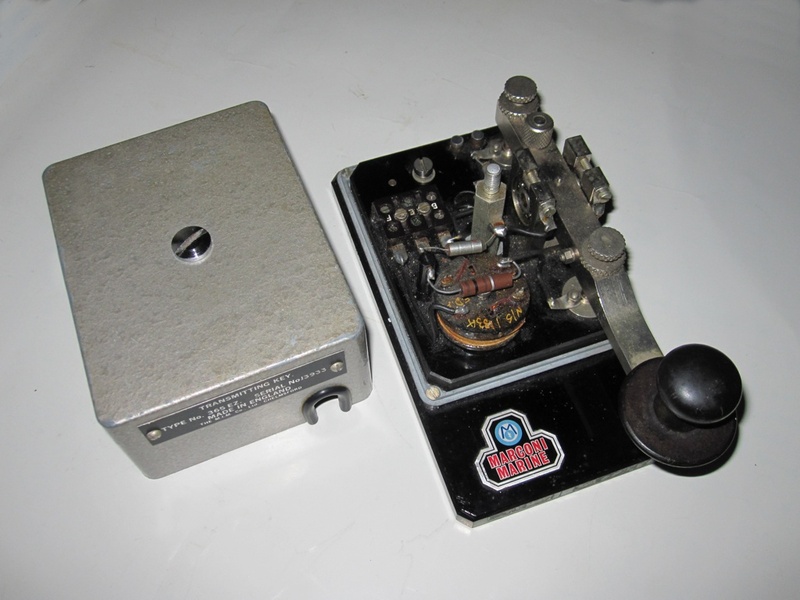 Another British KEY WT.8 AMP. No.2. MK III. It is a brass and black plastic key. See the evolution of the WT 8 AMP key here. K26. Built in YA1860 brittish mini key made by Plessey. 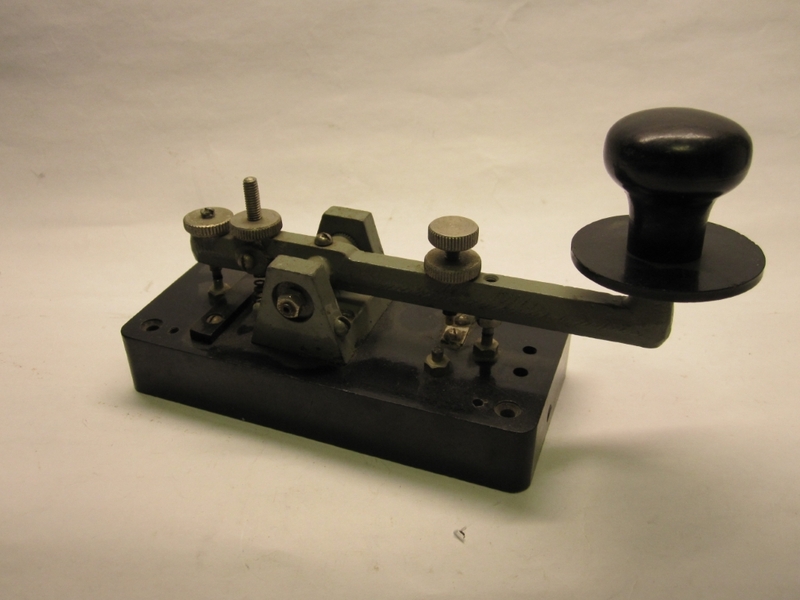 The key itself was originally a part of a British field phone set used to mark end of call or a free line. The aluminium casing and the knob are not original. K45. British RAF F-type flameproof "Bathtub" key ReF. No. 10/F 7741 from 1938 in perfect condition. Used on board British bombers (Lancaster, Halifax, Wellington and the Swordfish torpedo bomber) with the radio set T1154. Two versions are known, the black version, made by Northern Electric in Canada, and the brown one by the Royal Engineers at Inglis Barracs, Mill Hill, London. K55. 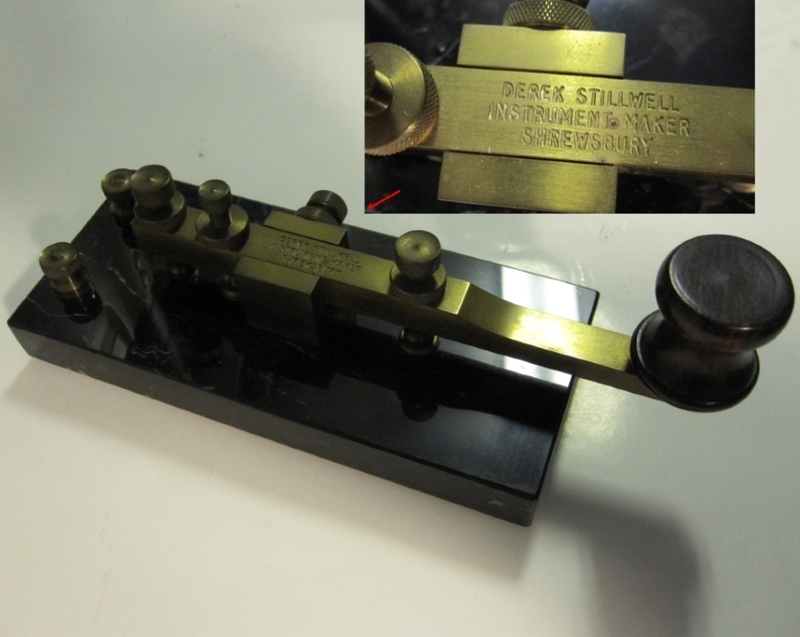 British S-R Cotel key, inspired by and successor to the WT8AMP No.2 MK III series (see K24 and K124 above). Made by G3SRK, Jack Sykes' company Lingard Electronics around 1960-1970's. More than 50k keys were made of this type. 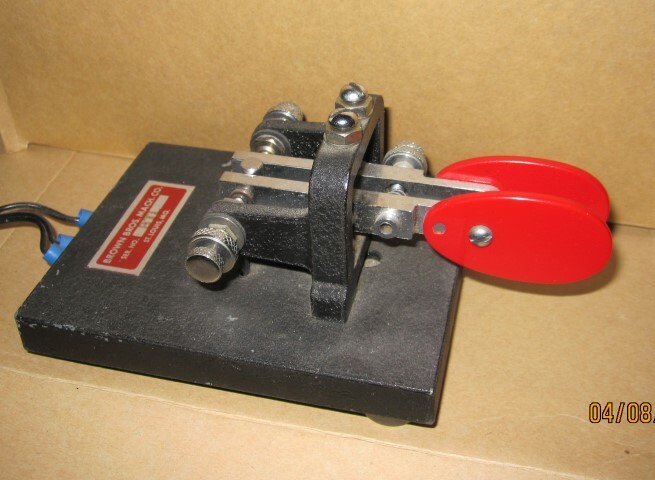 It is probably a testing key, there are different special keys for telegraph cable capacitance tests. Charge the cable from a battery for so many seconds, then discharge it via a galvanometer and measure the deflection or 'throw'. The cable would be connected with the centre, and the battery and galvanometer to the other two. K66. Clansman is a flame proof sturdy miltary key made by the Royal Factory of Ordnance in Blackburn for the British forces. In use since 1980:s for different Clansman radio equipment. Good condition. K76. British manual key made in the era 1920-1935 for the Amateur community by the department store A.W.Gamage in London. Probably a late model, since it's nickel plated. The knob mght be exchanged. 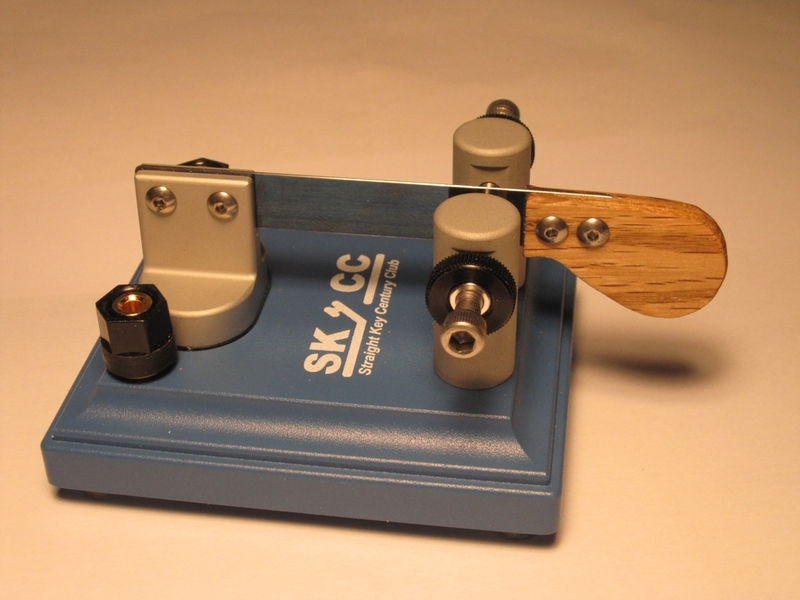 It came mounted on a board together with a mechanical buzzer/battery holder, so it has been used as a training key. Solid brass, good feel. K83. 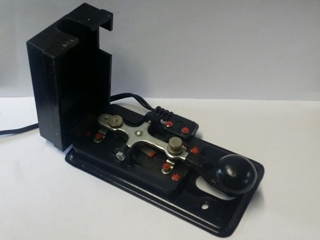 This is a Clansman leg key used with the VRC-321 or VRC-353 radios. Can also be used with back-pack radios such as PRC-319, PRC-320. A gift from my fellow ham friend Pontus OH6EOG. Vy thanks OM! K92. 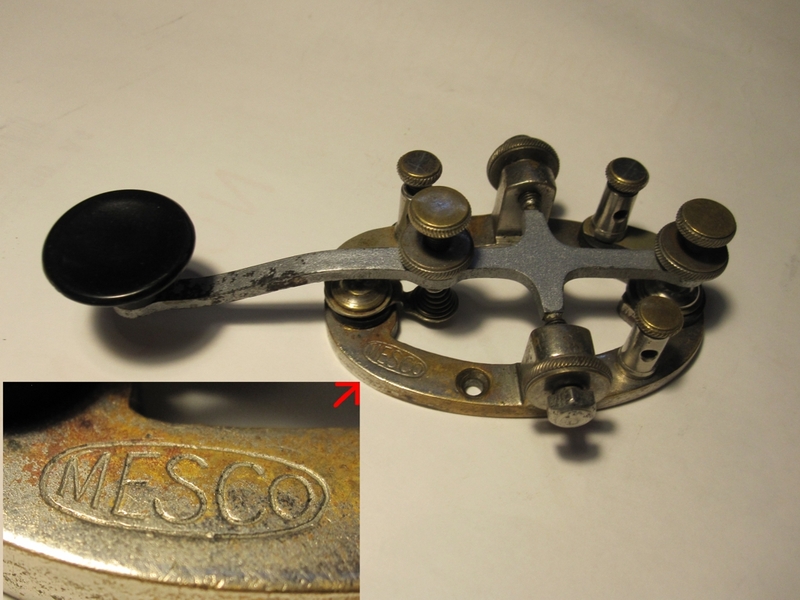 A pre-WW2 merchant or Navy Marconi 365A key made by Marconi International Marine Communications Company, MIMCo. It is very, very rare because all Marconi 365's have a black phenolic "bakelite" base but this one has a red base, probably due to shortage of materials during the time. It is otherwise original but now have a reproduction makers' label. Sleeve bearings. I was given this key by my very dear friend Patrick, ON6XS. Thank you! K102. 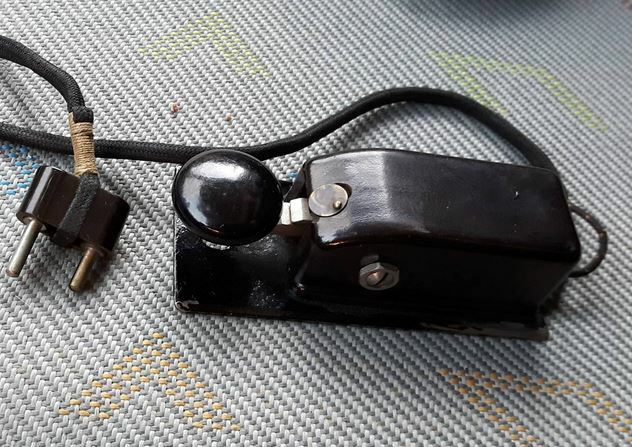 Dulci Mk II Professional bakelite key, british made By Dulci Co. of London for the Radio Amateur market in the era 1947-59. NOS in original pacakging. Nickel/silver contacts, adjustable spring, gap and needle bearings in brass, base is bakelite. Some rust pittings on the label probably due to damp storage. K118. Precision solid brass key made by Instrument maker Derek Stillwell in Schrewsbury, England about 1994-95. Arm is solid brass, length 178 mm, with silver alloy contacts. Knob is of padauk hardwood. The base is heavy polished black Portuguese marble, with non-slip ribbed rubber mat on the bottom. Total weight 1,2 kg, s/n 527100. Very good feel, this is an unused quality key! Quite rare. K125. Marconi 365 EZ commercial marine key, s/n 13933 by M.I.M. Co., Chelmsford, England. This key has been the property of a now retired Finnish "sparky" and followed him on several ships around the world. Weight is 1260 grams, size 100 x 165 x 70 mm. The operator has exchanged the knob to his preferred one. In vg condition. Interesting: The lid is marked "Eddystone 2343P" inside! Not procured yet. K2. 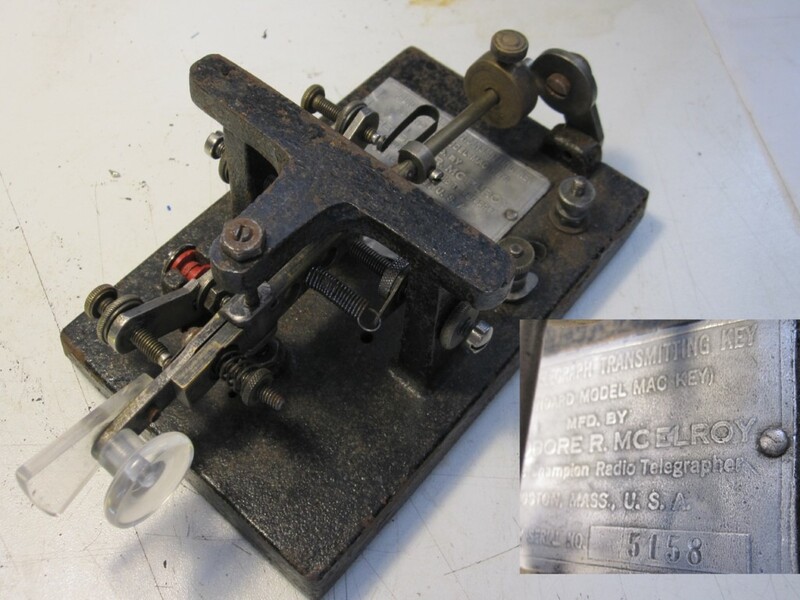 Speed-X american telegraph key made by Les Logan 1937-1947, mounted on a J-38 Signal Corps base. 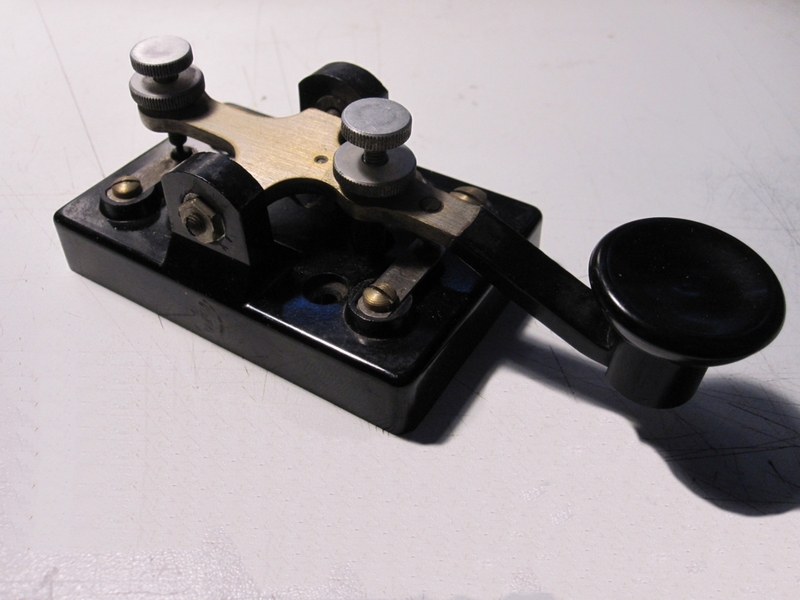 I also have another J-38 (maker unknown), which was given to me by OM Hannu, SM5KWU. Thanks OM! K10. US Signal Corps J-45 (J-37) pilot/tank key to be clamped on the thigh. Gift from Matti, OH1QT. K29. 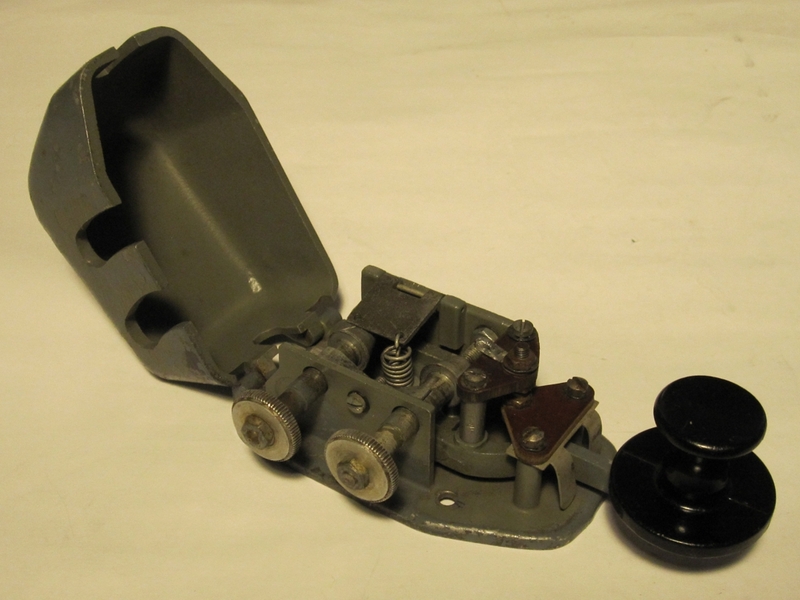 Hughes J-45 leg clamp tank/pilot key used by Swedish Army with the radio set Ra195 (PRC-104). Type KY872/PRC-104 (modified KY-116U), serial no. A 1132. Trade possible, I have two of these. K30. A brand new Hughes KY872/PRC-104 serial no. A 4503 used by Swedish army. See K29 for details. Gift from my good friend Olle, SM3YJE (SK). Thanks OM! K50. American Speed-X key no. 320 by WM.M NYE CO. INC. Bellevue, WA, USA. No. H15.681 in the cast at bottom. With Navy knob. Mounted in heavy oak base. Donors OH6ELN & OH6HXU. Thanks OM:s! K63. A legless Western Union 2A key, made by Thompson-Levering in Phila. 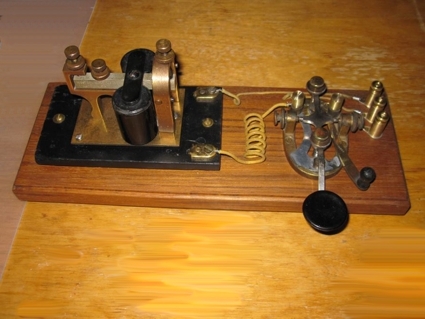 PA USA about 1910, here together with a working Western Electric telegraph sounder type 3C (140 ohm for main line, 43 mA @ 6 Volts). I had to rewind the coils on the sounder, and then mounted the parts on a teak board as a KOB. Testing video here! K91. I got this nice MESCO No. 244 Legless Open Circuit key (Manhattan Electrical Suppies Co., 1910) from my good friend OM Patrick, ON6XS i Belgium as a gift. Thank you OM! 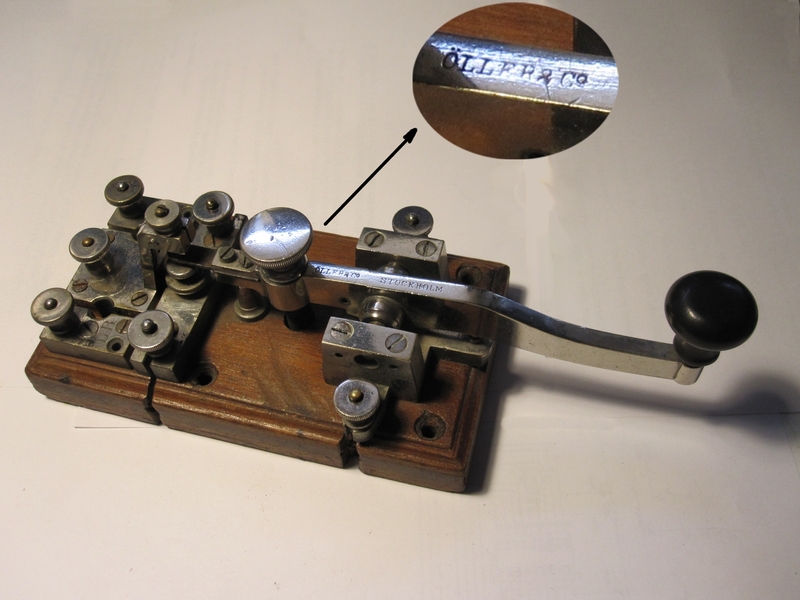 Typical American Speed-X-style telegraph key. Nickel plated brass frame, steel arm, silver contacts. Double circuits. Click on picture for a bigger view. Ref: TVC #19, p.7. K103. This is a J-37 from a Taffet training set, bulit in the US during WW2 for the Signal Corps by Taffet Radio & Television Co. Previous owner has attached it to a heavy lead mould base! The knob is molested, and need renewing, otherwise it is operational. Tnx info OM Giuseppe, IK8FYW. K104. 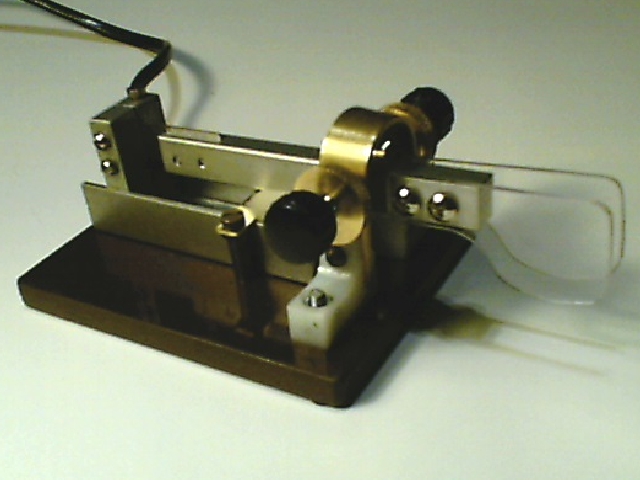 A contemporary Bencher RJ-1. Nothing special about it, it's pretty robust, but the American threads on the screws makes the settings very inaccurate. Condition as new, a hex Allen wrench is retained below the base. K107. 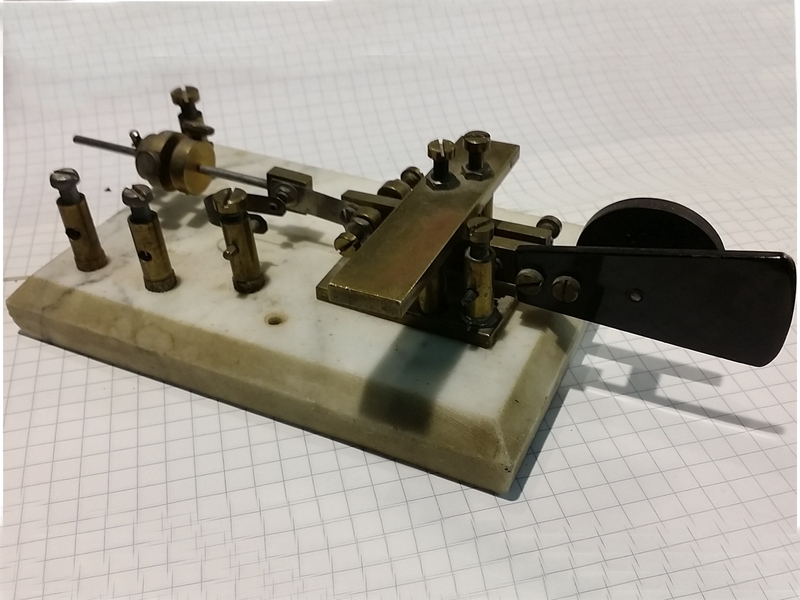 Telegraph key from SK OH6TS Rolf, given to me by Thomas / OH6LEI. Thanks a lot OM! I don't know the origin of this key, it might be American, but it is made of much heavier and thicker materials than the typical J-37:s. Any info is welcome! K112. 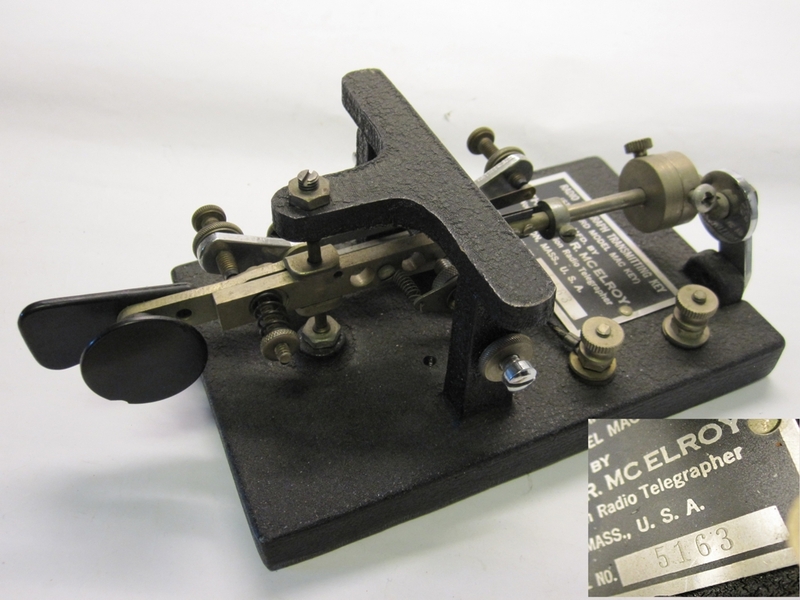 McElroy Stream model 200 key, made during WW2 (1940 - 1942). The base is coarse cast iron (magnetic), with wrinkle paint finish. No shorting lever. Some light rust on the arm. Knob is not original, but a Vibroplex replacement. Works good. K114. McElroy Stream model 300 Deluxe key, chrome finish. Magnetic cast iron base. This one has shorting lever. Nice condition, light rust on the arm. It sold for 2.85 US$ when it was new. K115. 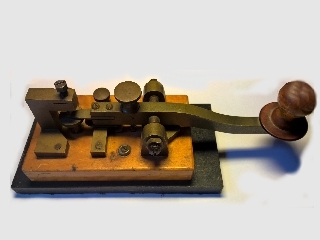 A Telegraph Apparatus Co. (TAC) key. Black wrinkle finish, good condition. Spring is a replacement. Differs from the McElroy's in that there is a bulge on the arm where the upper contact is located, and a somewhat larger base. The TAC Co. was co-owned by Ted McElroy. K116. 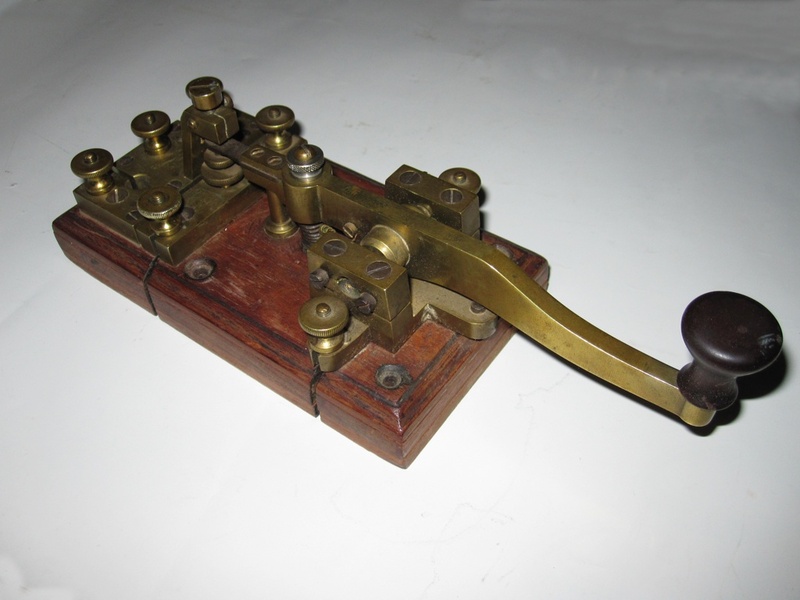 Another TAC (Telegraph Apparatus Co.) key. This one has a nice chrome finish. Working just fine. Differs from the McElroy's in that there is a bulge on the arm where the upper contact is located, and a somewhat larger base. K120. 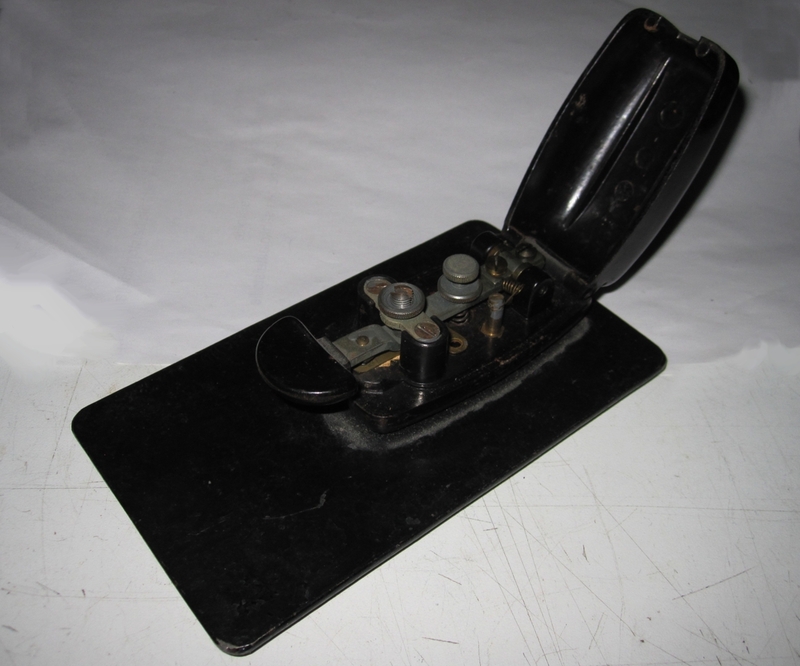 A CMI-26003A Flameproof US Navy key made by Molded Insulator Co., 335 E. Price St., Philadelphia, Pa. The Navy Flameproof 26003A key is NOT a copy of a German straight key, as many seems to think. It is an improved version of the model 26000, designed by the US Navy in 1919. Here links to the proof: drawing 1 and drawing 2 from G0RDO:s site. K5. German Josef Junker MT Honnef/Rh D.B.G.M. Post-WWII civil commercial version. K14. German Ta.P. Baumuster T1, ("Taste Paula"). 1934 pre-WWII key complete with rubber lined base. Also used in Finnish Army WWII station VREHB "Bertta". K17. 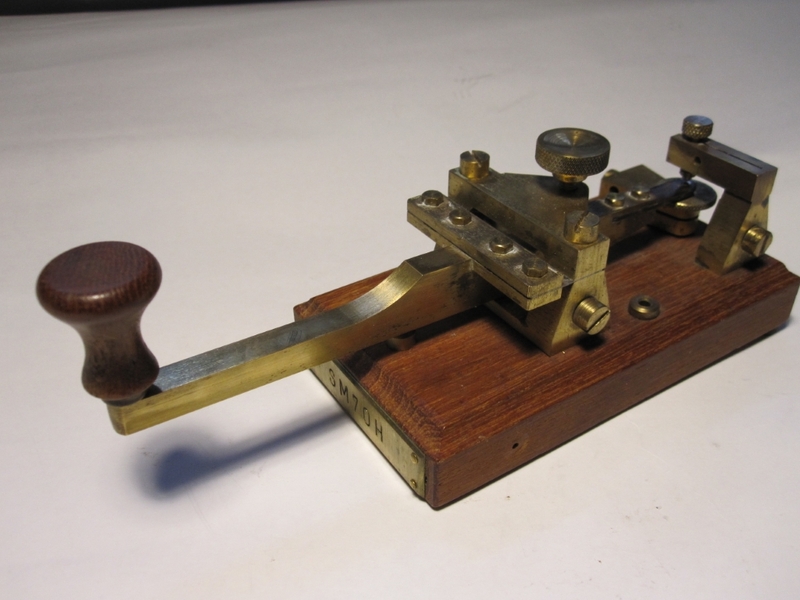 German Lorentz Baumuster T.2 Ln 26906, Hersteller D. The makers' sign makes this key rare! Mostly used by German WWII air force (Luftwaffe). I have another carcass for spares, should you need! K27. Siemens & Halske key (see K9 and K64) for training of operators for commercial shipping at Rauman Merenkulkuopisto (RMO). Has "RMO 160-11" (inventory mark) etched on the arm. K38. German Wehrmacht key TKP "Maus" (Taste Klein Presstoff), a small bakelite key from 1944. 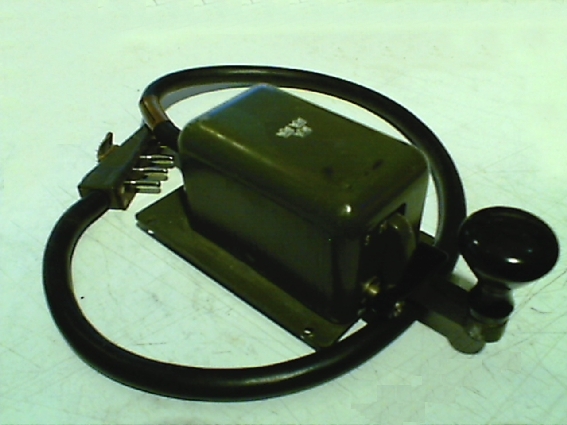 Used in agent-, mobile- and tank radios, for example the Tornister Funkgrät D.2 (Finnish assignemnt: VRKS). It has the rare half-round button. Markings "2M", "T1". Known makers: Konski & Krüger (code gvx, logo "k|k") and Elektronische Fabrik Weber & Co. Kg. (code epz"). No mark on this one. K39. 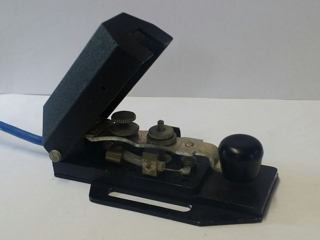 German Luftwaffe training key TKP "Maus" ("mouse") made of dark brown bakelite. This key has a round button. Markings: 1941 BAL 969, "T1" and makers mark "dbf/" (Hoppmann & Mulsow Elektronische Spezialfabrik, Hamburg). K58. German "klopfertaste", M.99 for German RTV and railways, built by Hartmann & Braun, Frankfurt a.M. Nice little brass key, w. silver contacts, oak base. Still used in WW1. Gift from my friend Kari OH5YW. Thanks OM! K59. German Post Office (Reichs-Telegraphenverwaltung) 500 year Jubilee reproduction key, produced in limited number 1990, sold at the Post Offices. In top condition, working, never used. No box or manifest. K60. Probably a German key. Nickel plated brass mounted on ebonite base. Size 68 x 107 mm. Holes for mounting. Maker unknovn, any info would be appreciated! K64. 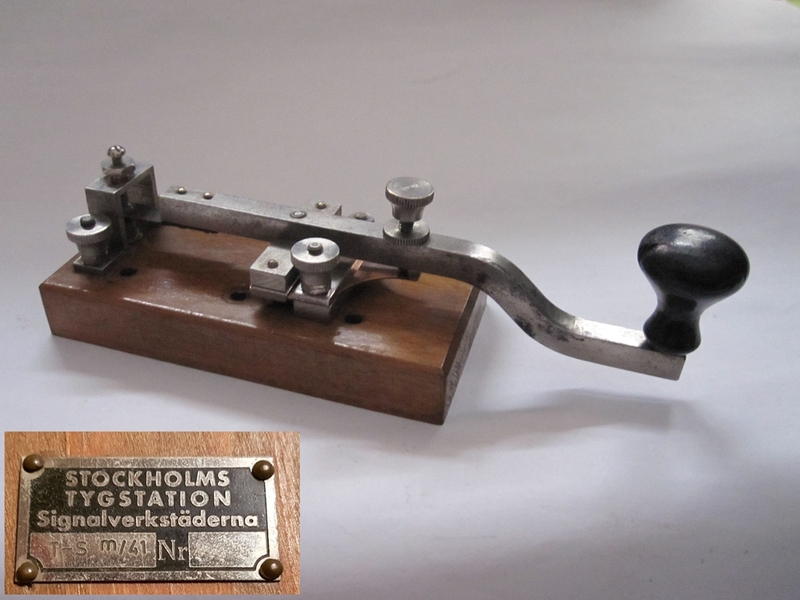 Siemens & Halske key, belongs to the land line Morse register R1 below. Serial no. 22288. Kyrillic logo С Г (S&H) on the bearing block. Made at S&H:s factory in St. Petersburg at the end of 1800's. K73. 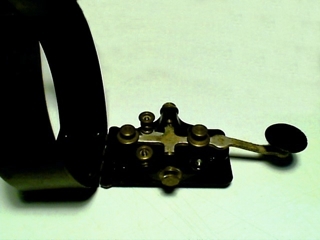 This is a very rare German "Reichstelegrafentaste" key for high current spark transmitters. Please note its huge copper silver filled contacts! Brass on ebonite base.The maker is probably F. Schuchardt, no markings. It is well used, almost all nickel plating is gone. Click on image to zoom. The Key was donated to my collection by Patrick Wathieu, ON6XS in Belgium. Thanks so very much OM! K95. German L.T.2 "Lehrtaste 2" from around 1938-1945. These keys were standard issue for training purposes by Luftwaffe. Stainless steel on bakelite base, originally mounted on a 2 mm thick steel plate. Maker unknown. K111. 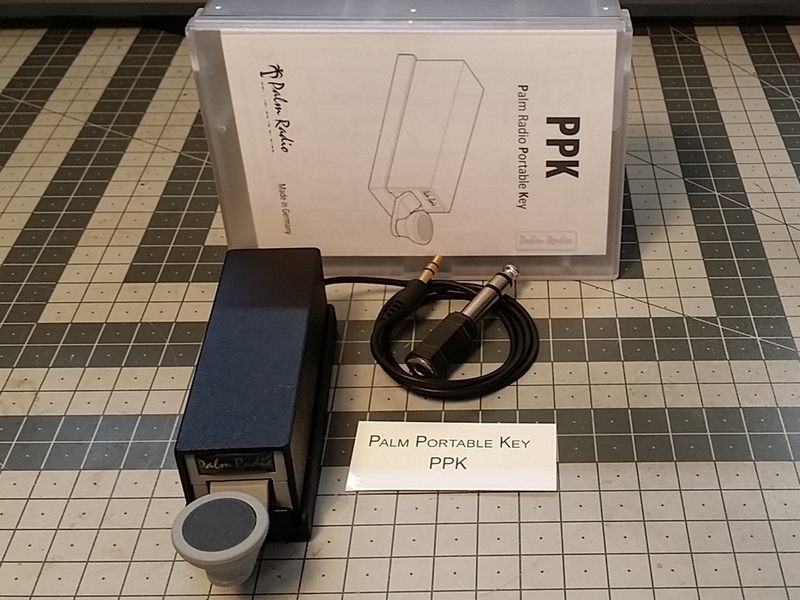 Palm Portable Key (PPK). 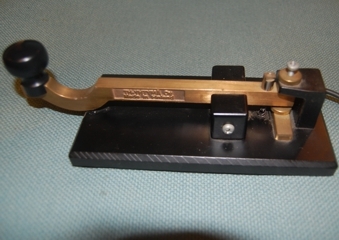 Small contemporary key made by Palm Radio in Germany. Especially for QRP use. Adjustable spring tension and contact gap with a small hex key. Strong magnets keeps it in place for example on a radio casing. Complete, new key. Palm Radio has unfortunately ceased operation as per October 2018. K113. An Allei Unit morse key (Einheits-Morsetaste) No. 76 from about or before 1945, made by Alfred Lindner, Machern bei Leipzig, Germany. Delivered w/o the dust cap option (76 P). 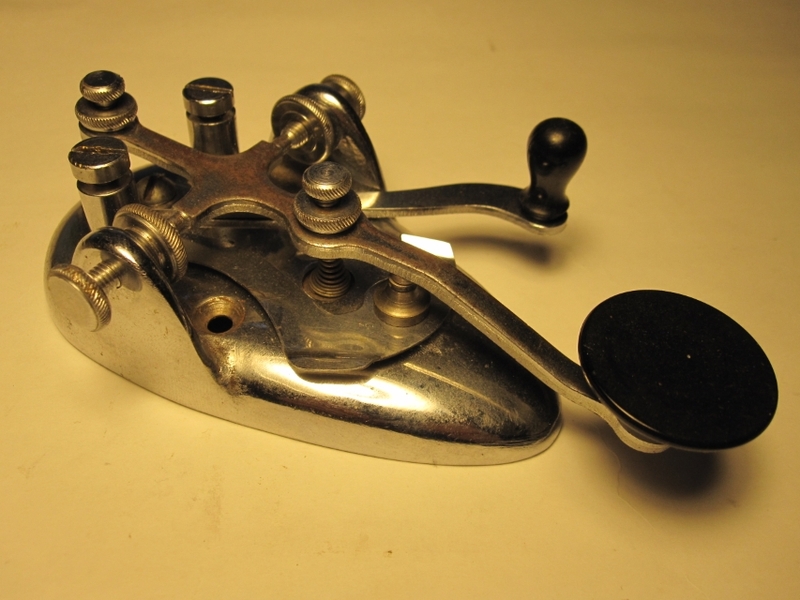 Other available options were 76 S (lead and plug), 250 gram iron base (76 E) and different types (concave or convex) knobs (76 K). K121. 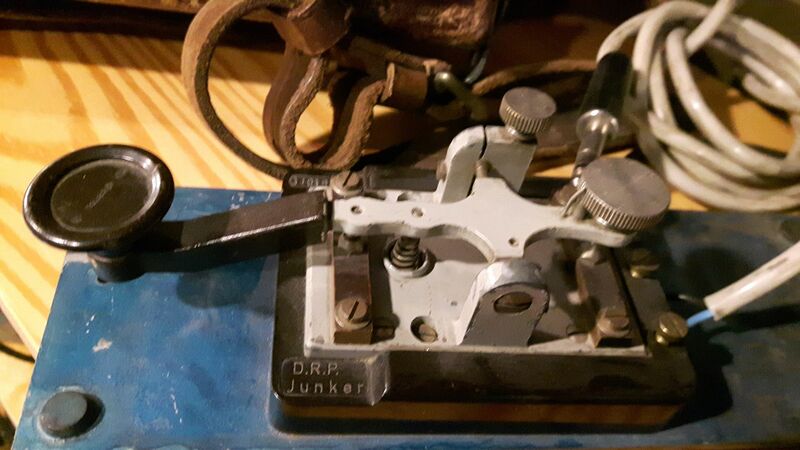 Josef Junker MT Honnef/Rh DRP radio key. These keys lacks the distinctive hinged cover. They were used indoors in offices etc. from ca. 1930 onwards. Donation to my collection by Kari, OH5YW. Thanks very much OM! K32. Morsetaste model K 40 - VEB KFZ-Bedarf Leipzig, DDR. East Germany (GDR) army key, late model. 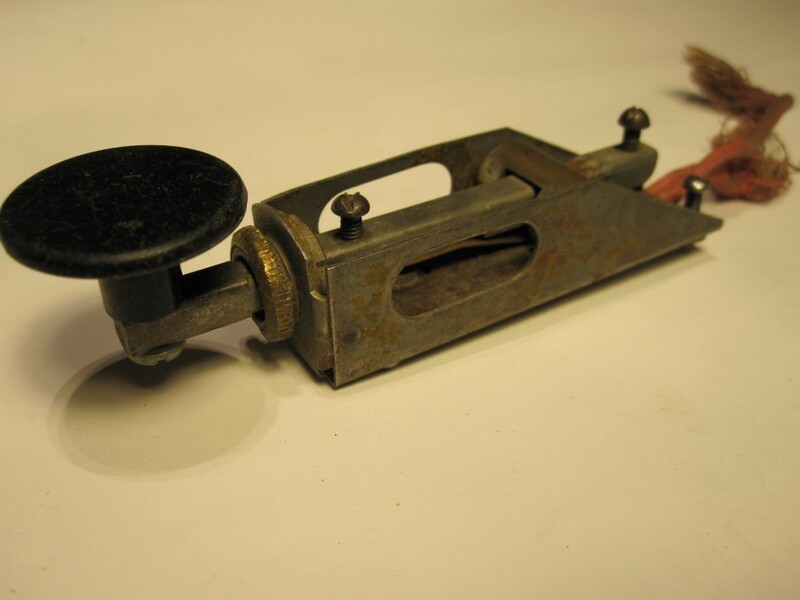 Early models had a flat knob. Identical to their model K 64, without cable and plug. All bakelite. 1958-1990. K56. 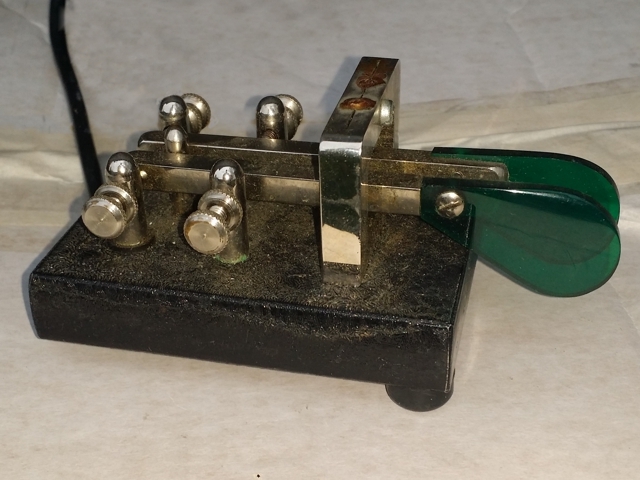 VEB RFT, Funkwerk Köpernick "MT 50" standard east German (GDR) flameproof telegraph key, in good condition except for the misisng rubber sealing parts. 1955-1990. Used at radio stations for commercial shipping, coastal radio and the People's Navy. Not procured yet. Trade possible, I have two of these. K25. Japanese "SATO" key made by SATO Parts Co. Moulded bakelite base, nickel plated brass. Good key. This is the bigger one, Sato Parts also produced a smaller model. K49. Japanese HiMound HK-708 key made by HI-MOUND Electro Co. (Takatsuka). Still produced, good condition, cable restrainer is missing. Bought from M3NGE, Nigel in England. K48. Japanese HiMound HK-707 key made by HI-MOUND Electro Co. (Takatsuka). Still produced, very good condition. Knob is not original, but much better! K34. Japanese Triumph copy mounted on a heavy brass base. Good feel and keying. About 1970's. Heavy brass base. K35. 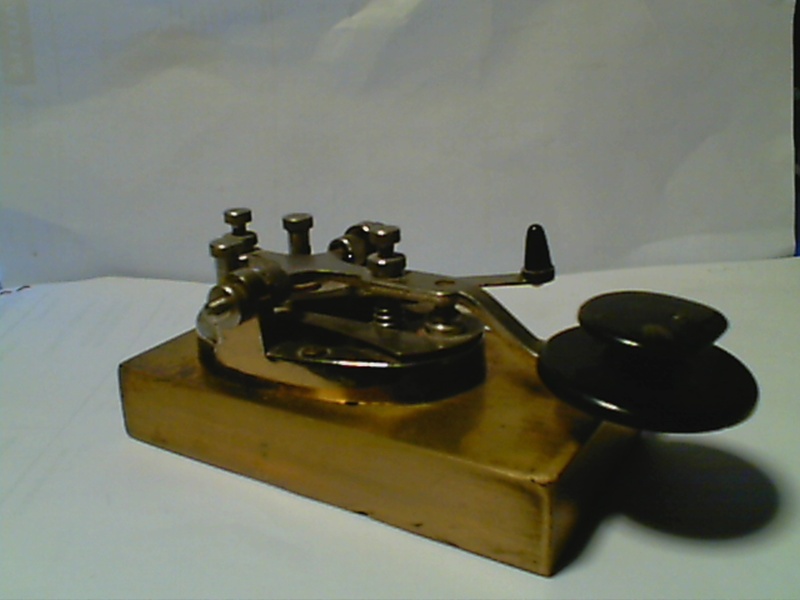 Japanese Speed-X telegraph key clone (Miranda model TK4) mounted on a heavy iron base. No shorting lever on this key. K22. 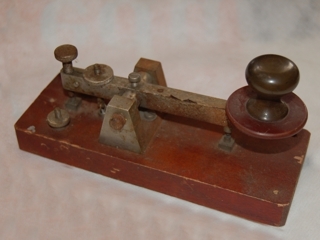 Chinese army key, type Yushan DJG-4, sometimes D117 or K4, made by Changshu Telecommunication. Heavy red painted cast iron base beneath the base chrome cover. K4. Soviet special forces key, for field radio stations like R-131,R-143 and R-159. Silvered contacts. Used in most Warzaw pact countries. Nickname is "Bereza" (Birch). K18. USSR 3TA (TKF) bakelite key, "OTK 123" approval stamp inside. Used by Finnish army (SA) for training and most Warzaw pact countries, post WWII. Made in Cherkassy, Ukraine by ZTA (Zavod Telegrafnoy Apparatury). K33. USSR era FEP training (фЭП учебный) key. Federal proof stamp (OTK 13) underneath. Made in 1978. K52. USSR aircraft key type P12 used in used in aircraft types LI-2, IL-12, IL-14 since 1945. Some extra fittings missing (switches?) in the near end. Aluminium casing, bakelite key. K53. 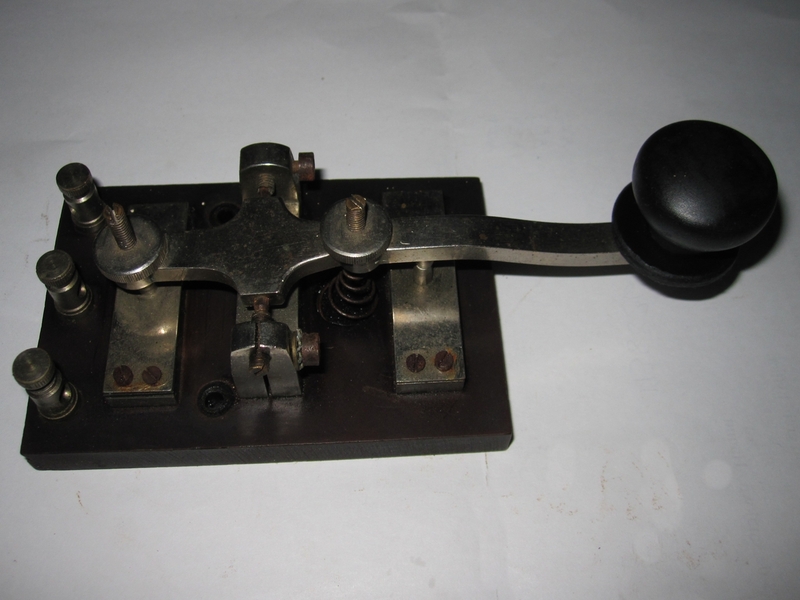 Flameproof USSR key КЛ4 (CL4) for several radio sets: R-102m, R-140, RSB, RSB-F etc. about 1960's. The base is bakelite, equipped with spark suppression components. Gray painted cast aluminium and the cover is thin sheet aluminium. Working voltage up to 300 volts. K54. The inner works of a similar key as K53 (left). Got it as a "sidekick" when I bought another key. "RSB-bis" painted on the Pertinax base sheet. 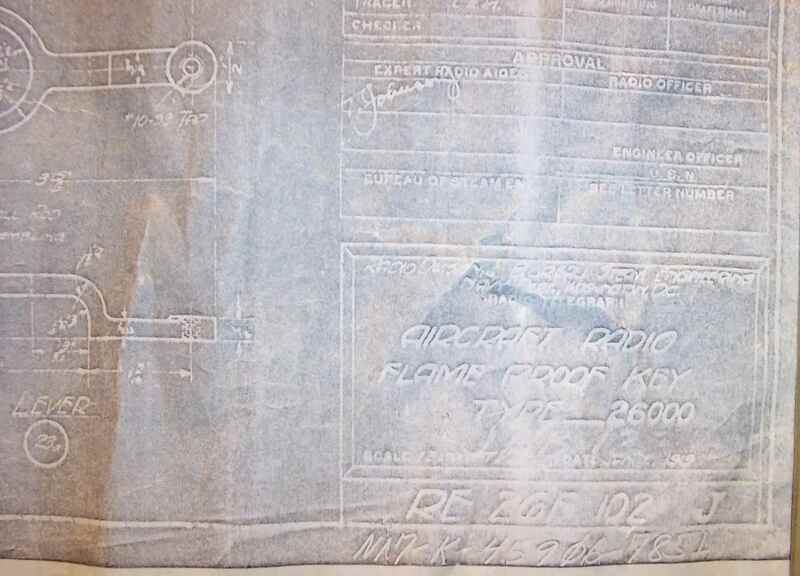 This one was used on a Штурмовик "Schturmovik" Czech attack plane with the later version RSB radio set. K105. Unknown (possibly Russian) key from a Finnish flea site. Any information is appreciated! Rough condition. Not procured yet. Not procured yet. K16. Warzaw pact military key, made in Hungary. Case and base is sheet metal. Used for the R-104 set. First produced in 1938. K36. The Cezcko RM1 key was made in the early 1950’s for the army in Czechoslovakia. Used for RM-3Ma TRX. 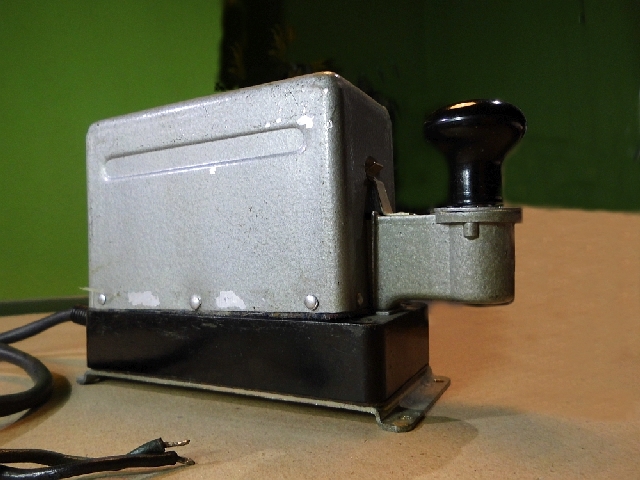 Lift the key lever to put the radio in receiving mode (Prjem), push down to transmit (Vysilani). Trade possible, I have two. K77. This is a miniature Bulgarian all-metal key used as knee-mount by tank signalmen, spies or other with needs for a tiny key. Brand new, never used. Size about 9 x 5 cm! K78. Here we have another Bulgarian army key from the 1970's. Made by Georgiy Parvanov Damianov factory in Razgrad. Metal base, stamped lever and moulded plastic cover. Poor quality, as with most eastern block stuff - cheaply made and flimsy! K96. Polish straight key "Bocian" (the Stork) from 1930's used by Polish national defence organization Liga Obrony Kraju (LOK). Similar pivot as in the Swedish key with a flat blade spring. Brass contacts, base cast iron Weight 1,4 kgs. Unknown donor, it just showed up in my maibox! Thank you, whoever sent me this nice key! K97. Serbian military key and headphones set JTs-RTG-01 made by Nikola Tesla Elektronska Industrija a.d. in Belgrad for the ex. Yugoslavian army. Condition unused. All parts inside are nickel plated or stainless steel. Base is plexiglass and cover is sheet metal. The cover has a volume control and a radio mode switch. The switch also turns on one of two tape recorders. K65. 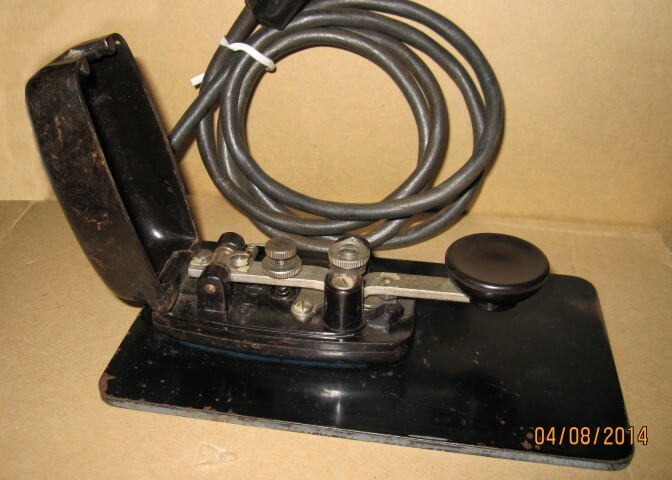 The "Rolls-Royce" of manual keys: an Italian Begali Camelback, serial no. 137. Jubilee model "Marconi Day October 2th, 1999". Gold plated, contacts are 925/000 silver. From an OZ-flea market. Click for bigger pic. K67. 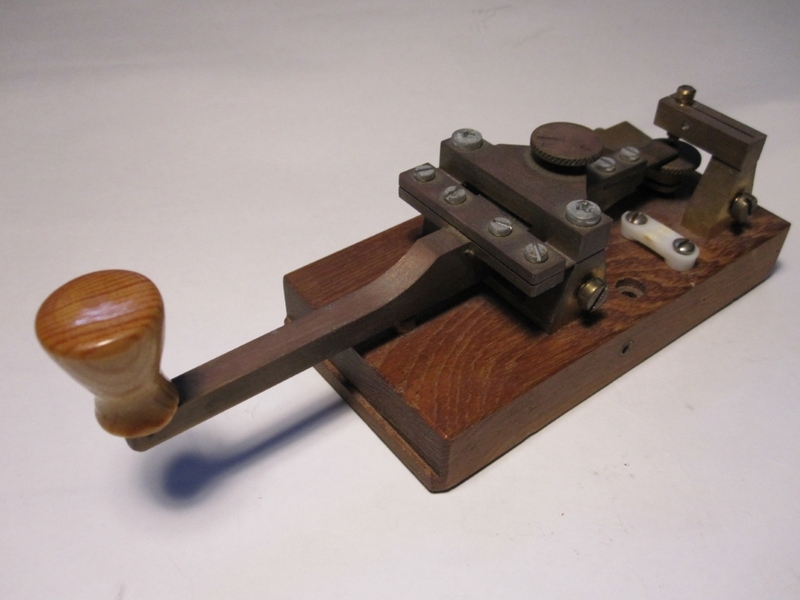 Llaves Telegrafica Artesanas (LTA) handcrafted GMV key, made by Guillermo Mestre Janer, EA6YG. Bought from CU2IJ in the Azores. Base is Spanish oak and the knob is teak. Solid brass, polished and lacquered. Used but in excellent condition. 8 x 14 cm, weight 360 g. K108. Swiss Army special troops training key, standard aluminium issue made by ZAG (Zellweger AG) & Knobel, used between late 30's until the late 50's. Base is beech. K93. 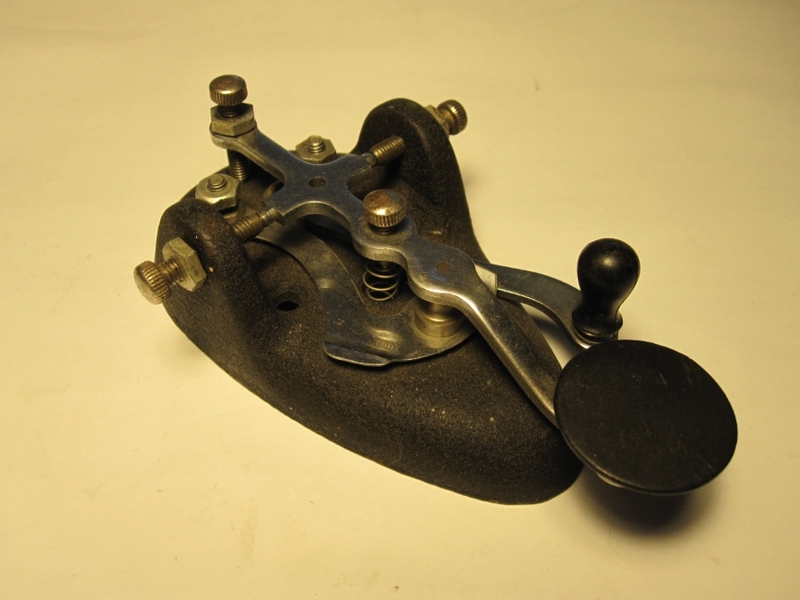 This is a French Air Force key designed by SARAM (Société Anonyme Radioélectrique Aéronautique et Marine) type v.1 and made by SIPL (Société Industriel Procédés Loth) in 1938 for use with the 3.10 radio set. This key actually served onboard a French bomber during WW2. It is originating from a Frenchman, who's father served on that aircraft. The key is the first version with screws at the bottom! Gift by my very dear friend Patrick, ON6XS. Thank you OM! More info: Christian F9WT (in French) K94. 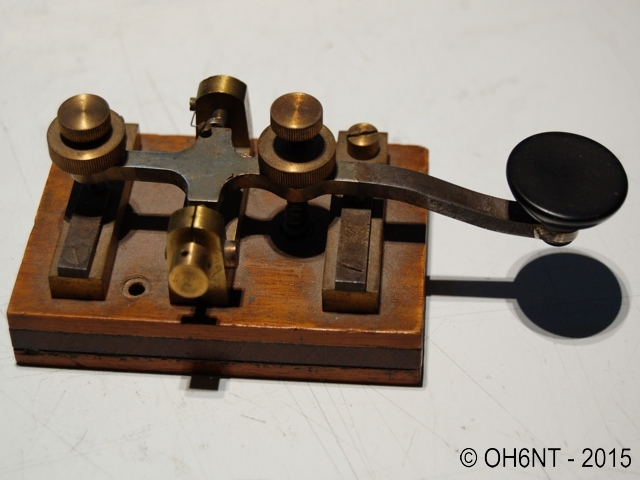 A second French SARAM-key, type v.2, bought from ZL2WT. Made during or after WW2, this key was part of a bomber radio set E/R 3.10 or 3.11 produced by BRONZAVIA. Also used in the commercial aricraft "Caravelle". For more details, see K93. More information in English here. K119. K.u.K. (Kaiserlich und Königlich = Imperial and Royal) Österreichische Staatsverwaltung Camelback from the time (1867...1918) of Dual Monarchy in Hungary/Austria. Wooden base, ca. 17 x 10 cm. All brass parts, including the return steel spring, has nr. "24" stamped on them. It is also written with a lead pencil on the wood at the bottom. Probably a serial number. No makers' mark, possible makers are Decker & Homolka, Hekaphon, Jacobi & Co. etc. about 1880's. Tnx info OM Stan, SP6JOE. B1. 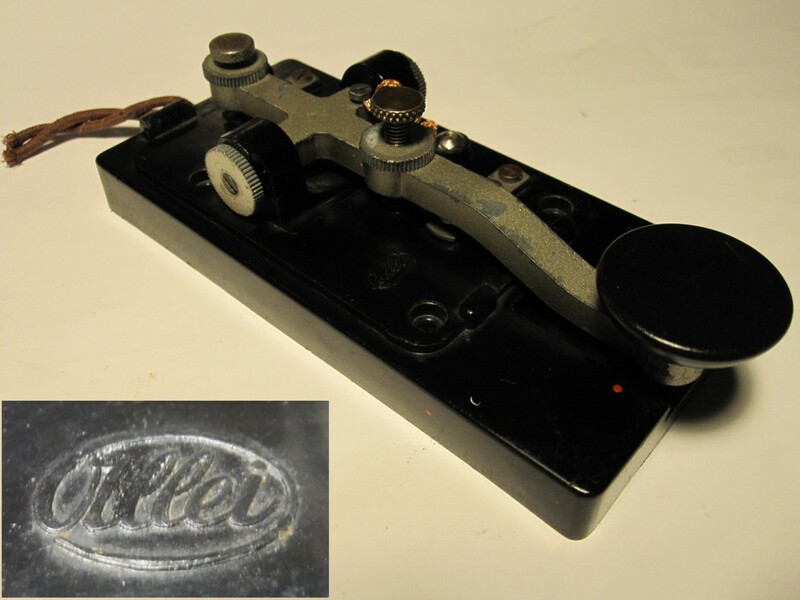 Vibroplex Original Deluxe, retro-fitted with the "Bugnapper" speed control by WB9LPU. Serial# 242628. Mfd 1965 according to dating table. Slow speed testing video here! The Bugnapper is really incredible! You can slow the key down to abt 10 WPM just by rotating a little knob! B2. 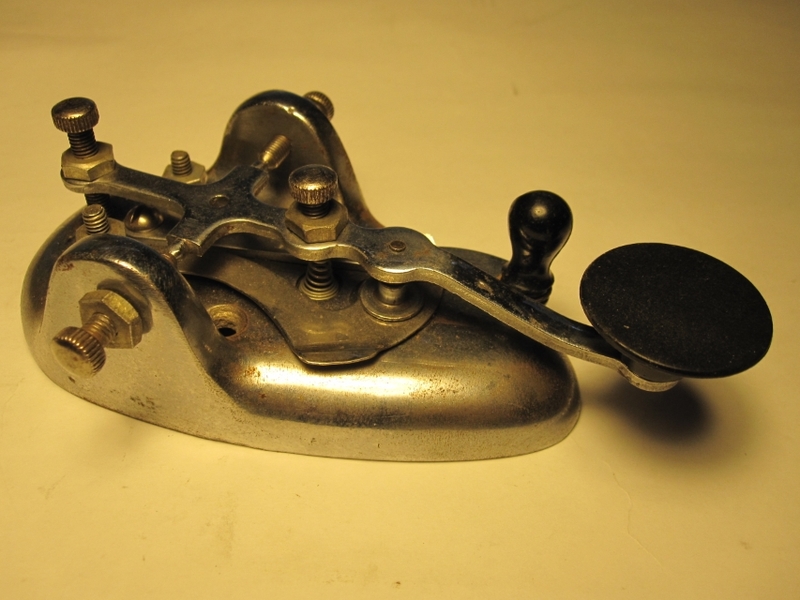 Vibroplex Original Standard. Serial # 217123. Manufactured 1961 according to WW7P John Elwood's dating list. From my SK friend SM2JKI Ahti. B3. A quite rare bug by Svenska Radioaktiebolaget, Stockholm for the Swedish Army. Type Bug 140, App Nr. 4031834. 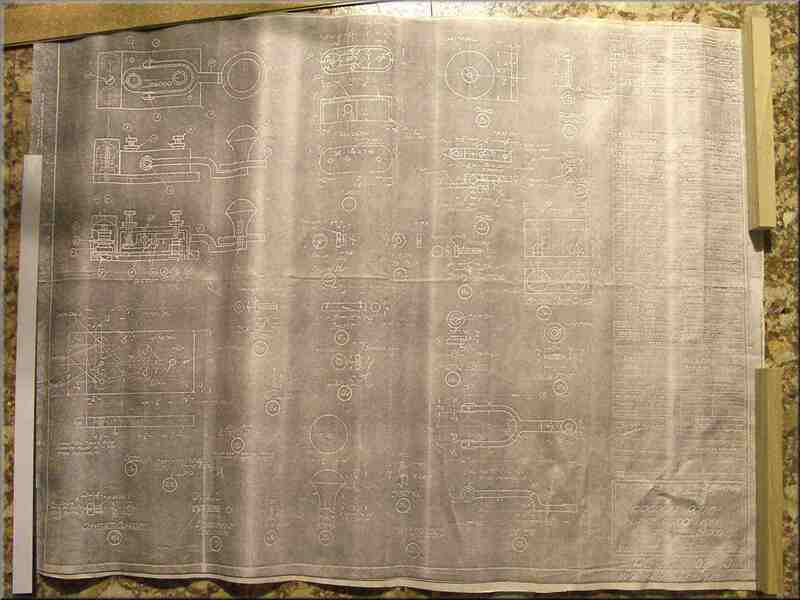 Design resembles McElroy Standard Model 500. From my SK friend SM2JKI Ahti. B4. Lionel J-36 bug, now fully restored, fully working. Some parts are new, from Vibroplex equivalent. Label is a reproduction one. This key was modified to a paddle when I got it, lots of missing parts. Click on the picture to see a bigger photo. B5. Hi-Mound BK-100. Japanese semi-automatic bug made by Dentsu Seiki 1953-68. Also sold under several other brands (Skillman, Monarch, Jelectro, Eagle & Swallow etc). This one is in especially good shape, no cracks in the lid etc. B6. Speed-X type 510 by Les Logan. No marks whatsoever, wrong color, but mechanics similar, according to seller this would be a German WW2 copy? Good condition, but shorting lever is missing. Works great. From a Swedish flea market. B7. This is a 1938B McElroy Standard bug. I tuned it to working order; it is not completely original. It has home made fingerpieces, a "hot bar" from the left terminal, and so on. But it works nicely, even if it's rough! B10. Another 1938 B McElroy Standard key, in excellent condition! Possibly one weight screw and the damper disc are not original. Serial # 5163, built by McElroy Manufacturing Company, n Boston, Massachusetts. B11. Home built bug by SK OH6TS Rolf, given to me by Thomas/OH6LEI. Thanks a lot OM! This bug has the same feature as a Mac Standard bug, it can be used as a manual key if placed in an upright position. The damper system is not complete, and needs some attention. Heavy marble base. Not procured yet. C1. 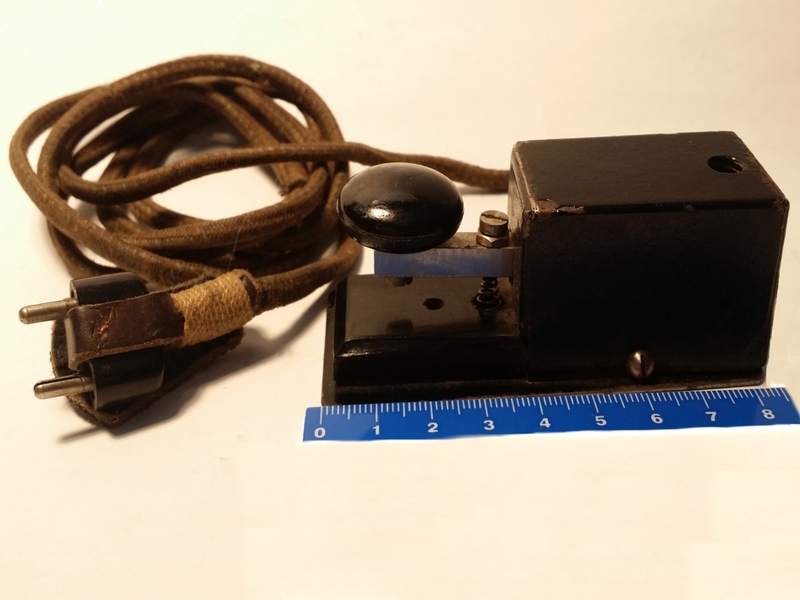 Swedish "Kungsimport" sideswiper (cootie), got as a kit from the maker Håkan Svärd (professional operator at Gothenburg Radio, SAG). Probably the last one made. Totally about 200 was made and about 50 exported. 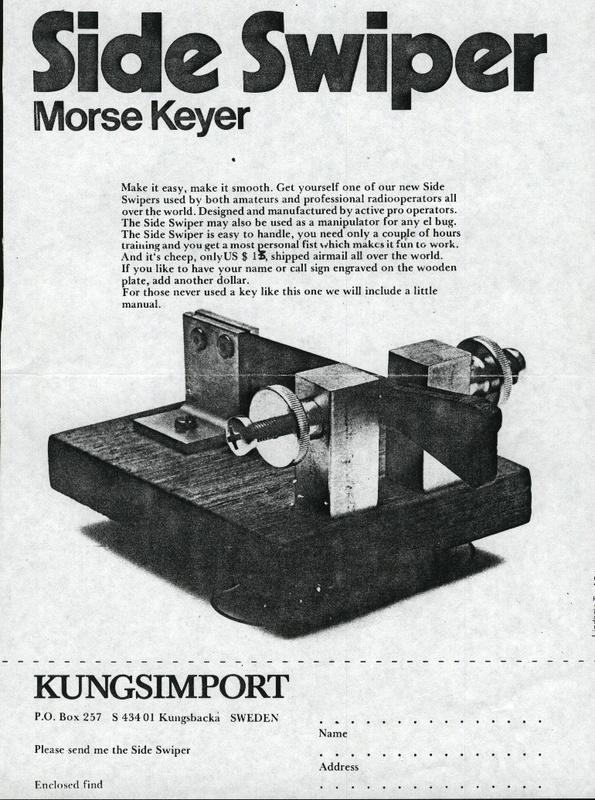 Here an USA sales ad for the key. C2. A rare bakelite sidesweeper from a Russian merchant vessel visiting the swedish harbor of Örnsköldsvik. Excellent condition. Swapped with OT OH6PA, Ben against another key. C3. My own attempt to make a "cootie". Some reposessed kitchen utilities and computer parts. Bending, drilling, grinding, threading, filing... And there it is! Smooth operation, bronze contacts. I'm pleased. :-) Testing video here! C4. Rare American Tele-Key knife or sideswiper. Moulded iron base, all original fittings. These sold during the 1930's and 40's. See 1938 Ad in QST. Some operator has weakened the stiffness of this knife by drilling several holes in it near the base. Info from OM Lynn, N7CFO: The Legend, Don W6AM also had one of these! More info needed! Click for a bigger picture. C5. This is a nice sideswiper machined from brass, and mounted on a 6 mm thick prespane sheet (paper reinforced Bakelite). 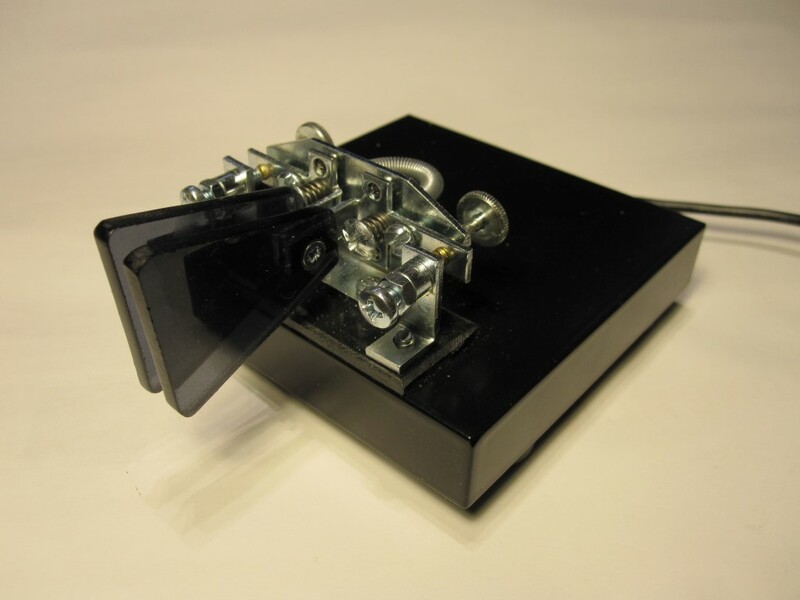 It needs mounting on a heavy base in order to keep it in place during keying. Maker unknown (from Great Britain). Any info would be appreciated! C6. A home made cootie (as they often are) by OT OH6OQ Keijo (SK). Made of plexiglass, aluminium tubing, and a hacksaw blade. Bronze contacts. Nice action, but needs mounting on heavy base to keep still while working. testing video on YouTube. C8. SKCC Sideswiper model 2018. Very nice cootie, smooth action and resembling the Kungsbacka cootie C1, but much heavier. Expecting this to become a real Collector's item! Not yet procured. M1. Bencher BY-2 chrome dual paddle. I use this at my home QTH. M2. Made by Finnish amateur OH3WZ Markku Harkamaa. These were sold in the 80's. Several of these are at large, one is at our club station. This one traded from OH5BW. M3. Another fine paddle made by OH3WZ. Apparently this has been in his own use, it has his callsign (engraved brass plate) attached. Bought from a fellow ham, OH3KRH. M4. Brown Bros. Mach. Co, serial# (model) BTL St Louis, MO. Chrome and black. Labelled "Patented" at bottom. BBMC made this key from 1964 to about 1974 according to The Vail Correspondent #2/1993. M5. 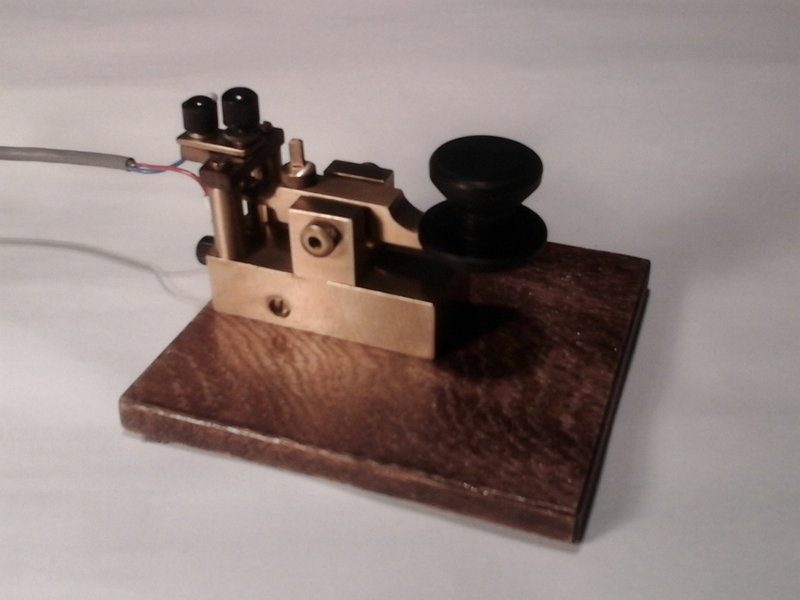 Paddle made by Olli OH4LRP from parts of an old telephone exchange. Very smooth and exact action, heavy base plate! M6. 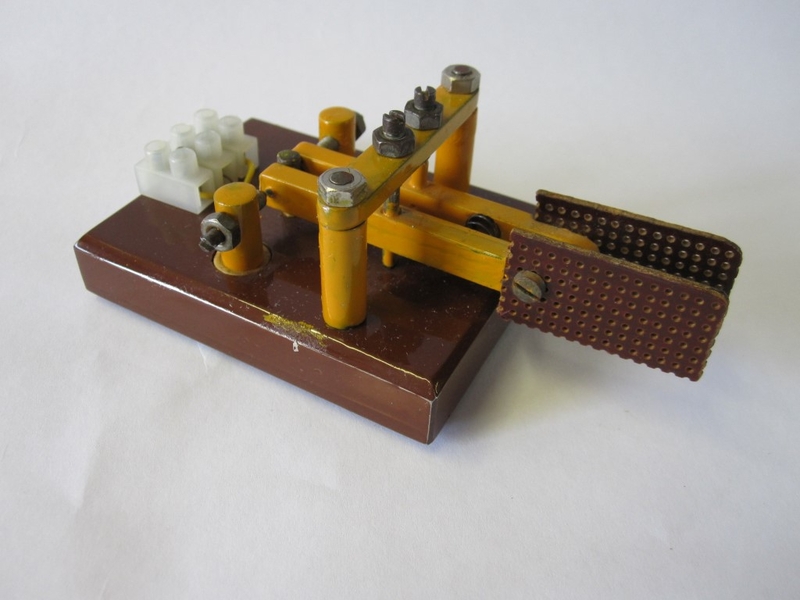 Bencher style keyer manipulator by unknown maker. From ham estate sale, mediated by Vesa, OH7XI. More info wanted on this one! M7. 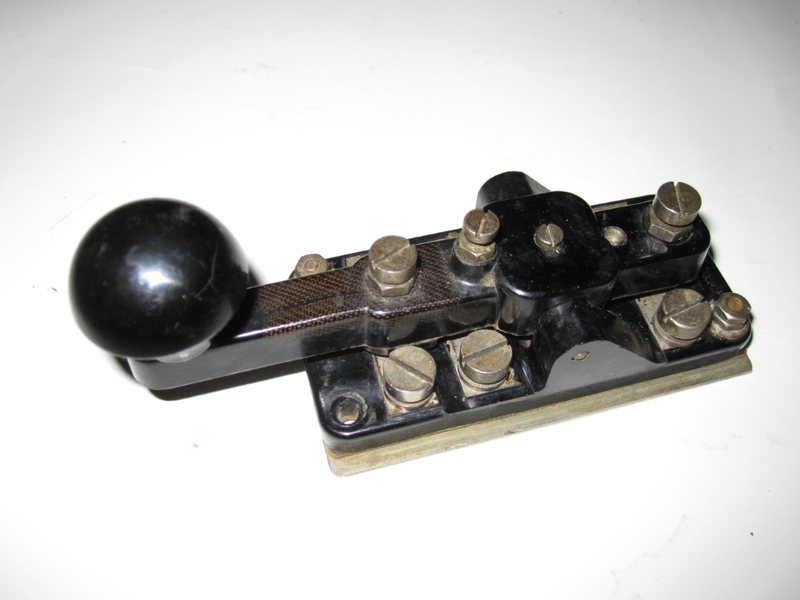 Probably home made spring action paddle, probably from telephone parts. Heavy brass, well made. From Sweden, previously owner SM7JMA. M8. 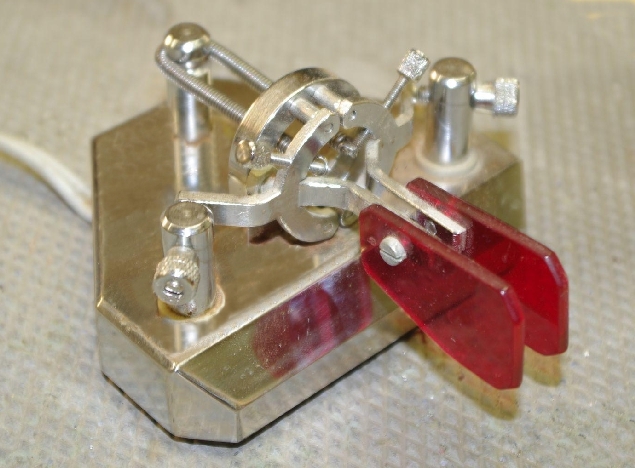 This nice tiny manipulator is constucted by OH2BT Risto Tiilikainen, and made by blacksmith Reino Haapanen. Heavy metal base, black wrinkle paint. Very accurate push-spring mechanism. Bougth togehter with, and belongs to keyer E5, the Golden Key. Tnx info OM Oliver, OH2BBR. M9. Japanese HK -705 double paddle manipulator on heavy marble base, made by Hi-Mound in Tokyo. No dust cover included, they are sold separate. M10. Amateur made small manipulator made 1967 by a ham in Helsinki, and donated to me by Kari, ex. OH2BHM. Thank you Sir! M11. Vibroplex Iambic Standard paddle, serial #53669 indicating mfg year 1986 according to dating table. From estate sale. M12. 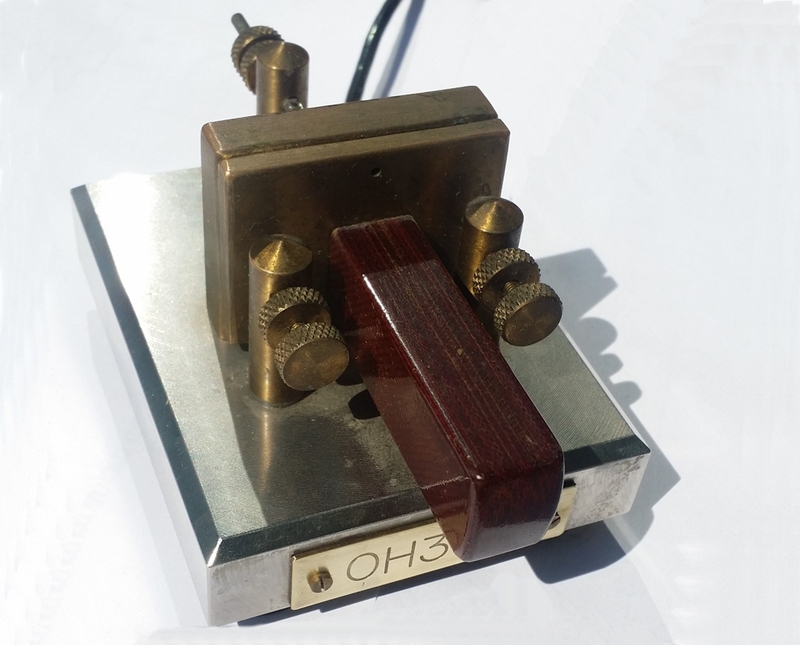 KBX-380 paddle made by Tapio Hirvikoski, OH1KB. OM Tapio is still in bussiness. He donated this to me when I provided him with some help. Thanks OM! This key is deemed by operators even better than the Bencher BY-1! See my Flea market page if you want one yourself! Here WB4RFQ is testing the key. M13. 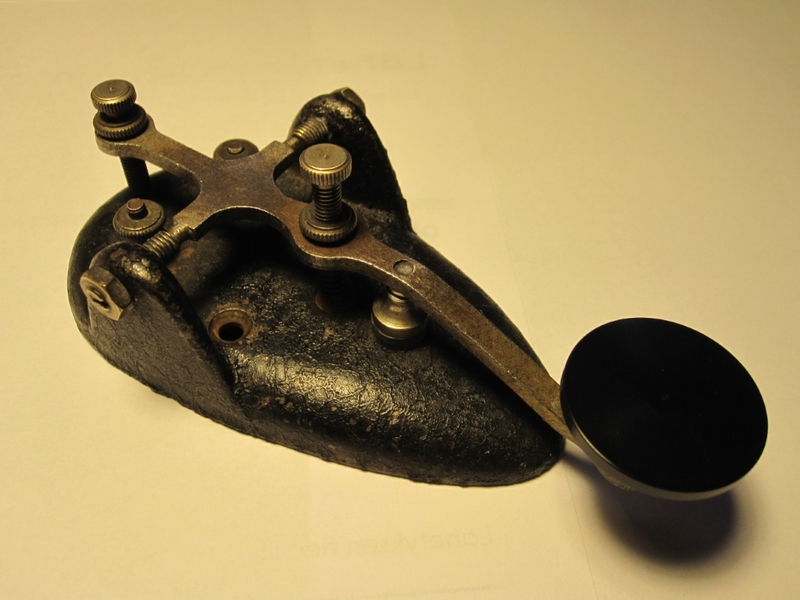 Miniature paddle from German Palm Radio, type MP-817. Unused set, complete with all acessories (cable, magnetic mount, documents, double sided tape pads and travel box). Palm Radio has unfortunately ceased operation as per October 2018. M14. 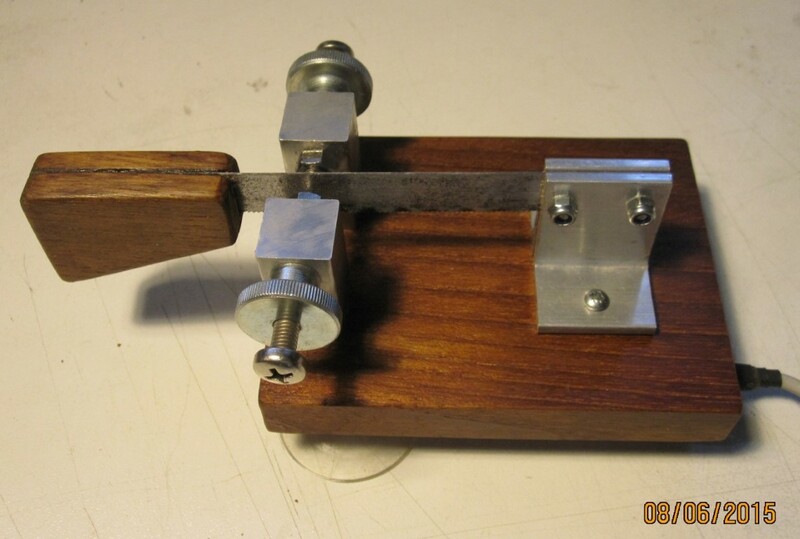 Bencher style keyer manipulator made by Turku Radio Club OH1AA in the 1980:s. Gift from my good friend Kari, OH5YW. Thanks OM! (Better picture later when in my posession!). There are still nine available with black fingerpieces at the club! M15. Not yet procured. E1. 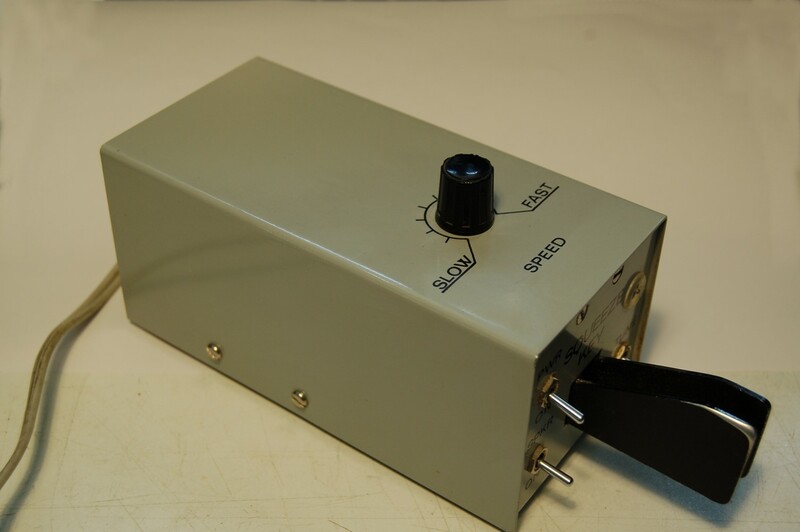 Heathkit HD-10 electronic keyer, in working order. For 115 VAC. Here a short test video. E2. 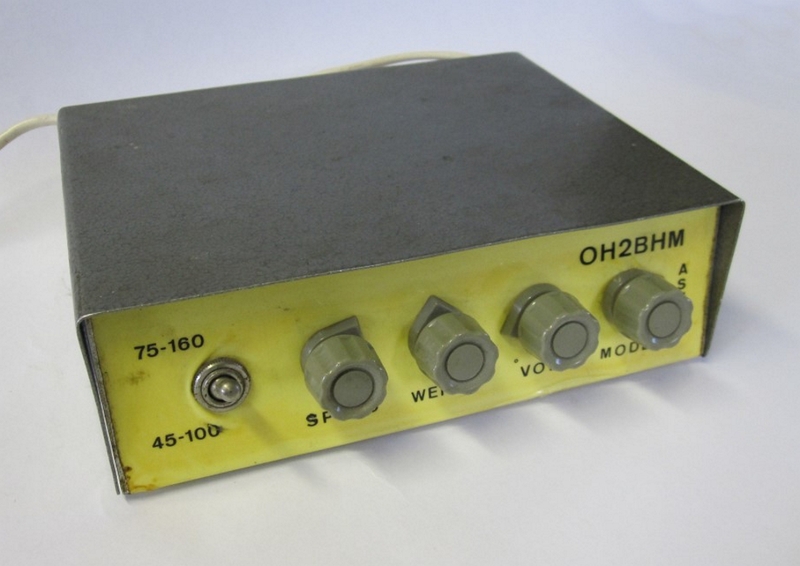 Heathkit HD-1410 electronic keyer, in working order. 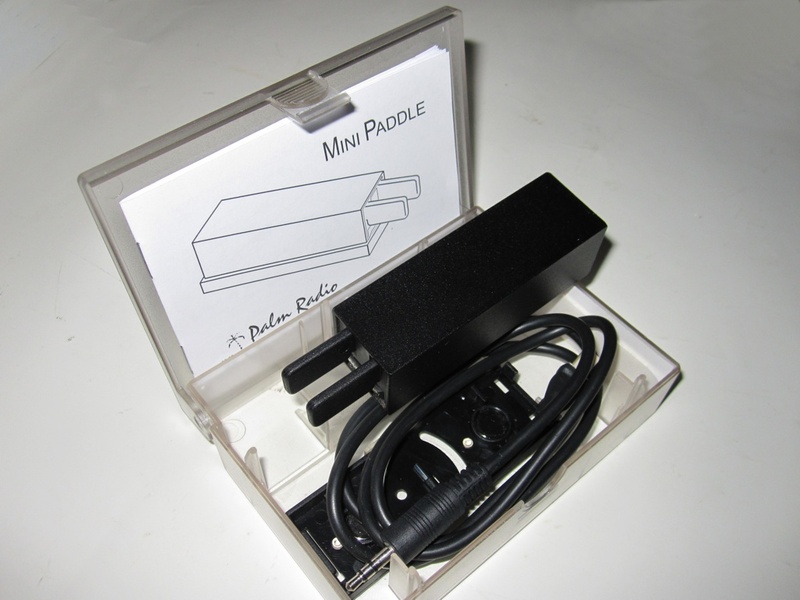 Can operate from 230 VAC or 12 VDC. Showing the key in action here! 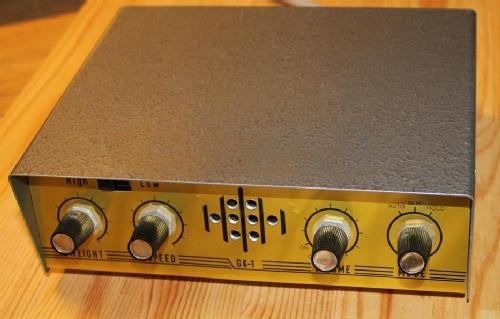 E3.This is a Finnish KBX-101A keyer with integrated electronics, made by OH1KB Tapio Hirvikoski in Pori. This is rare because it's white; the standard color is black. The white ones were made in limited numbers for the German market according to the maker. He also made straight keys, see K43, K44. E4. 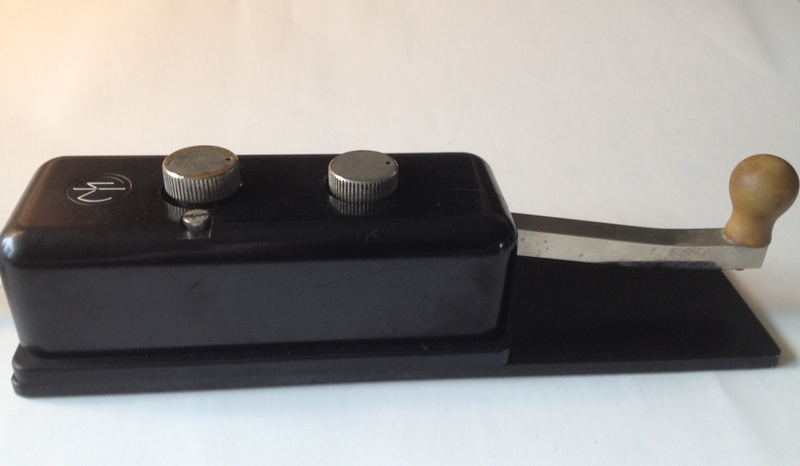 This keyer is made in Denmark by PBE-elektronik, type MSK-5 Squeeze Key. Used by operators in the Navy and in the Army. NOT Iambic, only a dot memory! Mains powered, internal sidetone speaker. Defunct at the moment. Gift from my dear friend, OH6IU Pehr. E5. The legendary finnish Golden Key elbug bought together with the M8 manipulator from SK OH6MK estate sale. Not tested yet. Photo by Matti Käki / OH2BIO E6. Homebrew copy of the Golden Key (see E5) built in 1967 according to a description in the Finnish RA magazine by Kari, ex. OH2BHM, who also donated it to me. Thanks OM! E7. Hallicrafters T.O. keyer, model HA-1 boght as scrap from the US. It uses "digital" tube circuitry, designed by Jim Ricks, W9TO (sk) and was produced 1960, costed new $79.95. Circuitry is complete, but was tampered with. 4 x 12AU7 tubes and a 275B Mercury wetted relay. 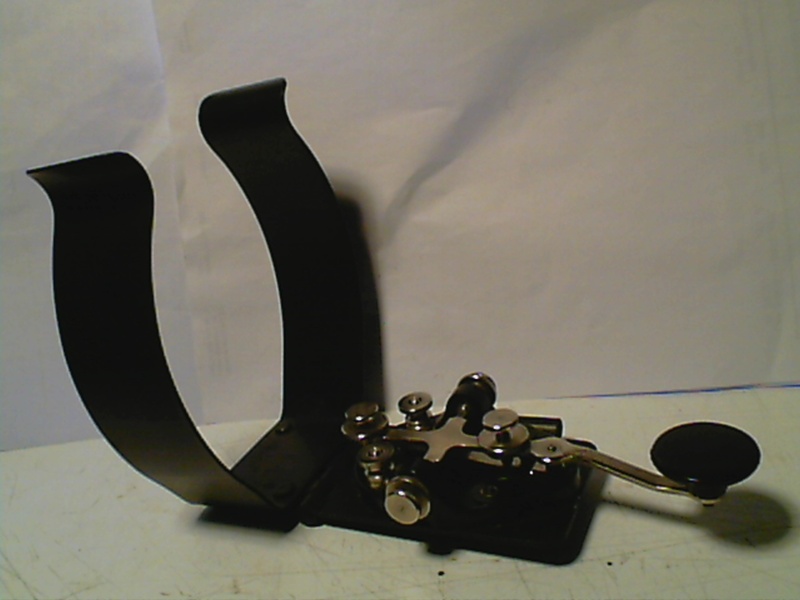 Refurb'ed and QRV now, see video here. New knobs aquired by kind help of OM's Ron, W6QM and Gary K5JWK! Tnx! Not yet procured. Not yet procured. O1. 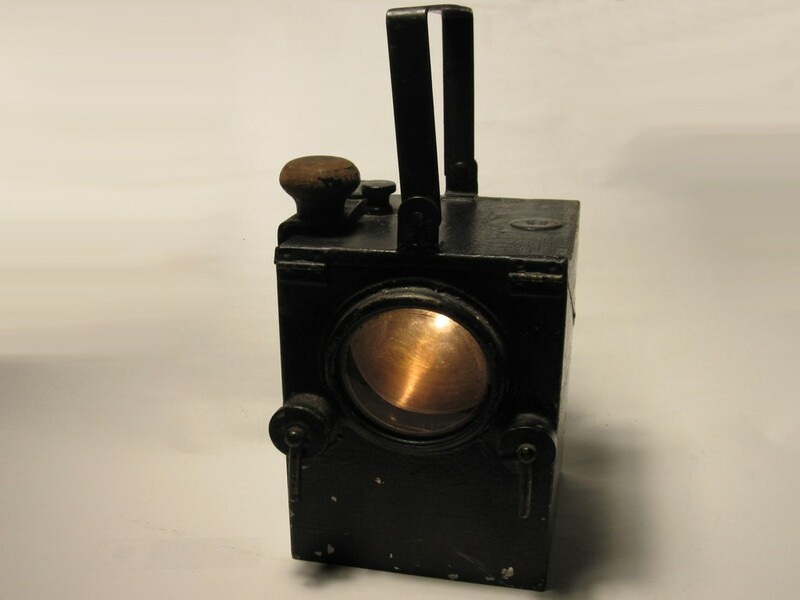 Signalmans Morse lantern from Karlskrona Naval Shipyard in Sweden. Made of zinc plated painted sheet metal. Probably from 1955 (has a stamped tag "55" on it) but might be older. In working order, uses one 4,5 V block battery (included). Can show white, red and blue light. 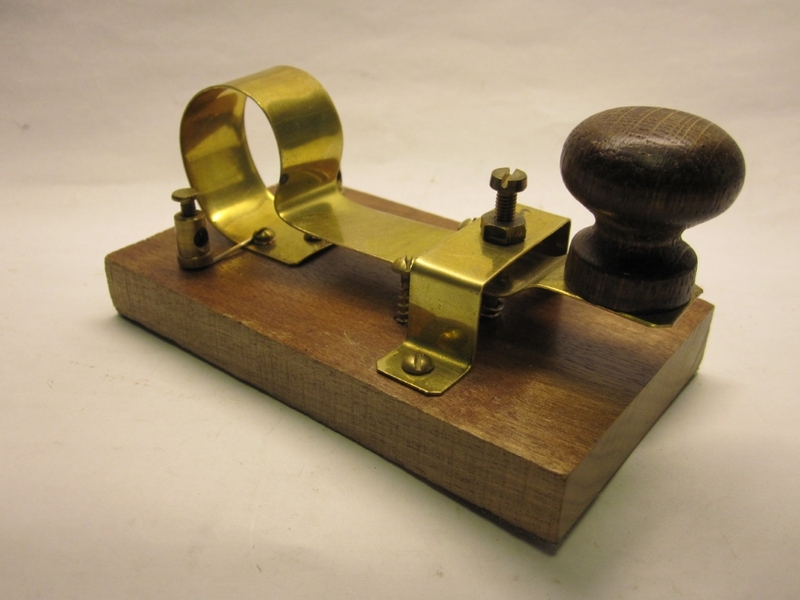 Signalling is done with a telegraph key on the top (left in the picture). Maker unknown. O2. 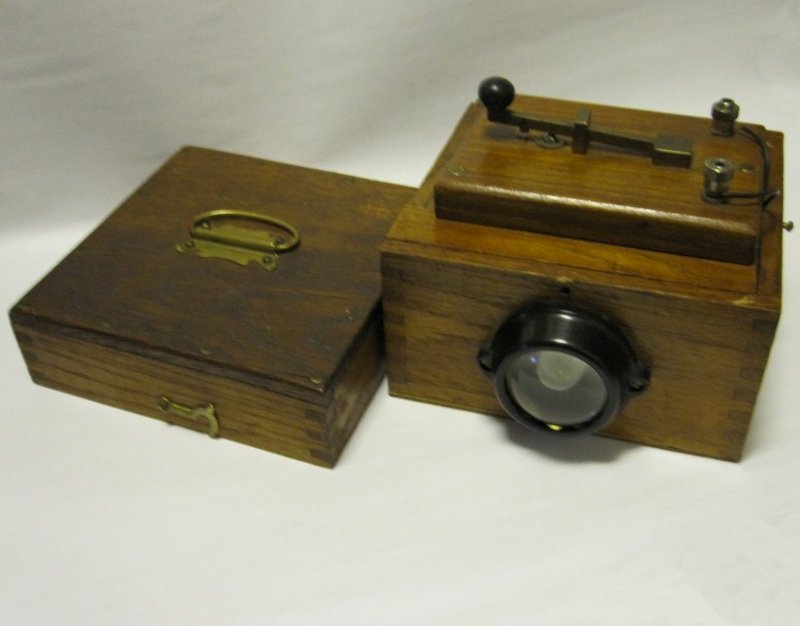 Home made optical telegraph with key on the battery case top lid. Used probably by the fishermen on the SW coast (unlikely the Finnish Marine) for signalling between ships, or ship-to-shore. Probably the early half of 1900:s. Box is oak, fittings are brass. Functional. O3. 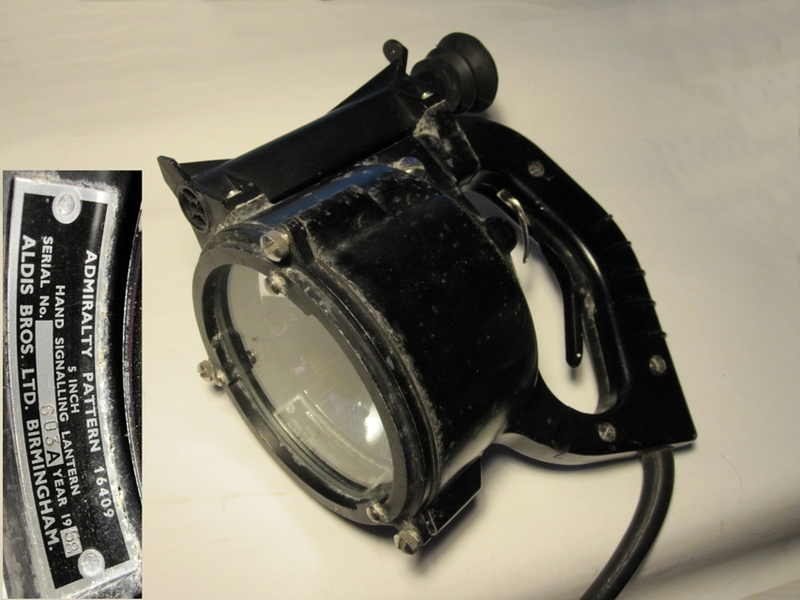 Aldis Bros. Ltd, Birmingham, UK made this 5 inch Hand Signalling Lantern in 1958 with serial number 603A. It is an Admiralty Pattern 16409 currently missing it's light bulb. The light bulb should be a special bulb for this usage, rated at 24 V / 60 W. This is a very appreciated gift and a great contribution to my collection from Frank Berglund, LA9IQ. Thanks OM! Testing video here! R1. 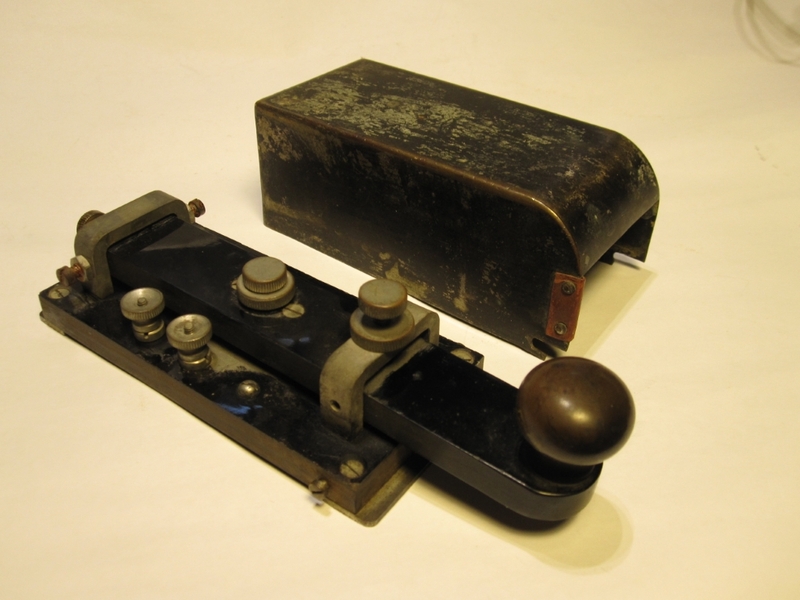 A Siemens & Halske land line ink register for railroad telegraphy, built in St. Petersburg, Russia before 1898. In working order. Serial number 19612 accordning to embossing (see picture below). Complete with key (see K64), also by S&H in St. Petersburg. These registers were designated "VLAK" in the Finnish army. This one is from the School of Shipping in Raumo. Closeup of the serial number. R2. 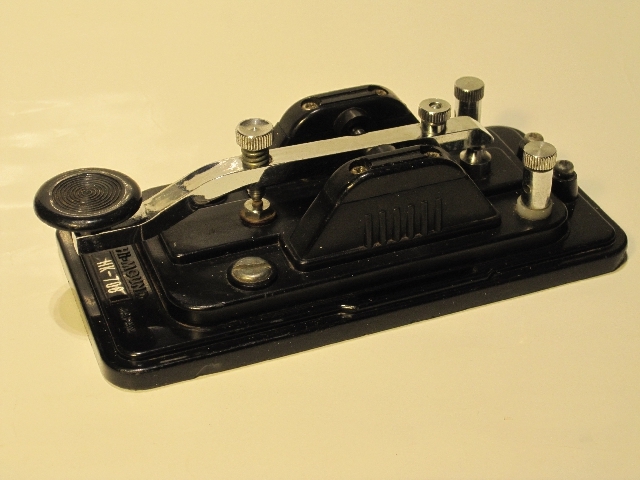 A complete Finnish State Railroads (Valtion Rautatiet, VR) landline Morse register, serial #31. 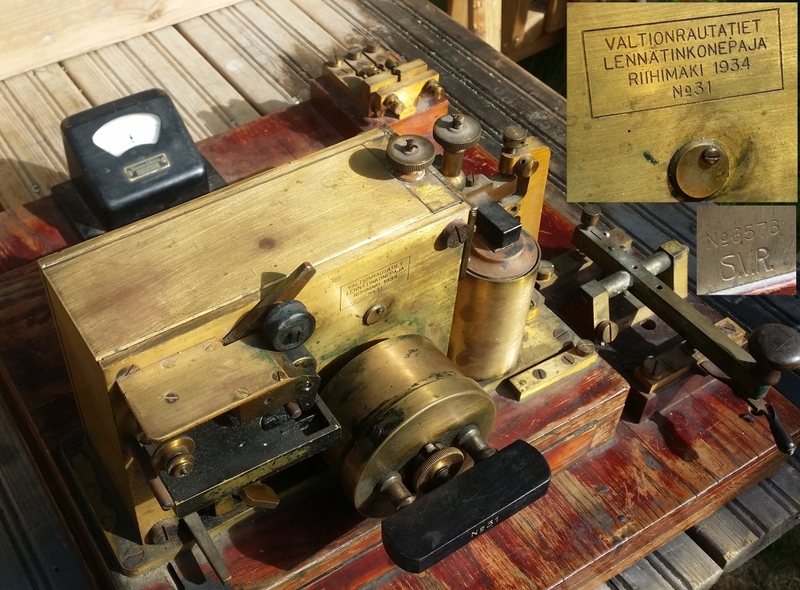 Includes galvanometer, line selector and key (Siemens & Halske, No. 6578), built 1934 by the VR Telegraph Works in Riihimäki. Good visual and functional shape! Copy of a German Siemens & Halske register, probably made on license. 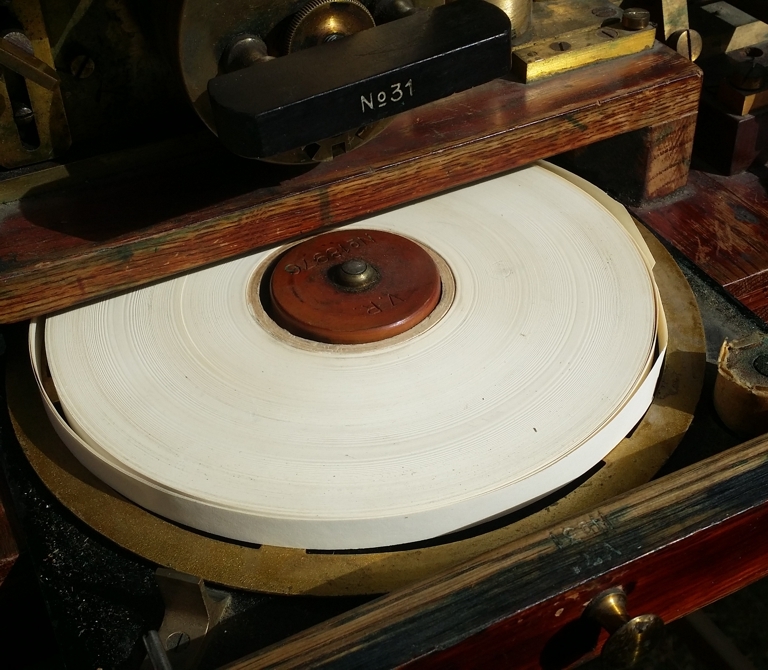 The ribbon reel lies horisontally in a drawer below the mechanism, see picture below. T1. This is a cheap toy key, "Space Station No. 107" for learning Morse code, made in Hong Kong in the 1950's. Works on two C-cells (3 V) and produces buzz or light when keyed. Fair condition, some rust. From a net auction site. T2. 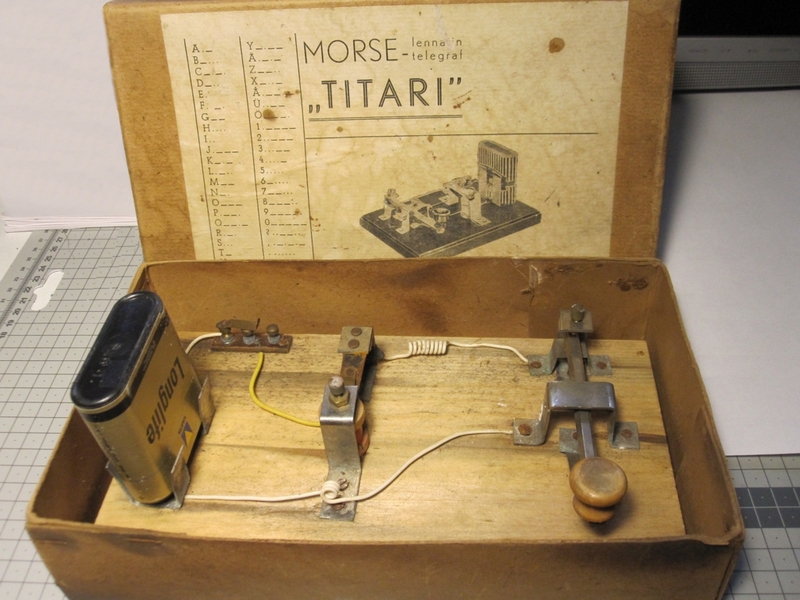 A Finnish Morse toy telegraph "TITARI" found at a flea market. It is a kit from Aarne Laaksonen & Co. in Helsinki. Probably from the 1950's, it would have been any boys dream back then when no cellphones existed! The price, 488 Finnish marks, suggests timeframe before 1963 when our currency was divided by 100. Rare piece. Instruction pdf leaflet here (tnx info OM Kimmo, OH1CM). T3. 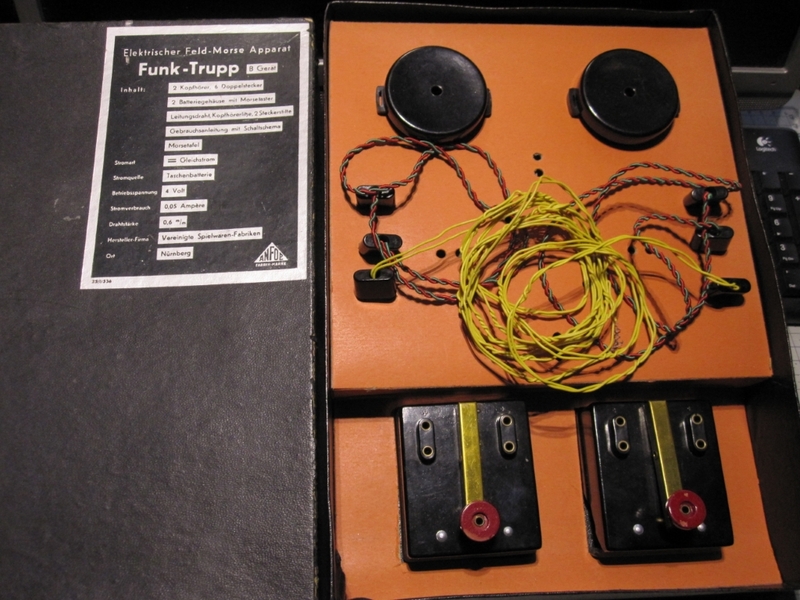 This is a "Funk-Trupp B Gerät" toy telegraph set in original box by Vereinigte Spielwaren-Fabrik "ANFOE" in Nürnberg, Germany. All parts are original and in good order. The box is worn and broken in the corners. Timeframe is the 1950:s. Also sold under the trade mark "Trix".